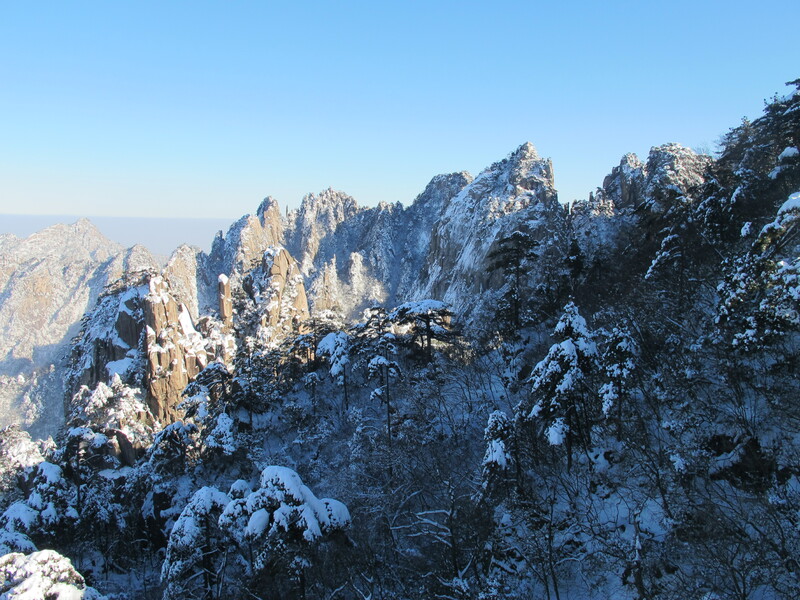 Cuandixia is located in Mentougou district which is about 90 kms west of Beijing. I had already visited the village in winter, but clearly had forgotten how far it was and told the others who came with me that it was an hour trip (just so you know it is 2.5 hours each way)but anyway I wanted to return to explore the stone paved lanes in summer and see the green trees on the mountains and glad I did. So off we went, relatively early on a sunny Sunday morning in July. I hired a bus with a few friends and colleagues from the Embassy and my visitor from Australia. 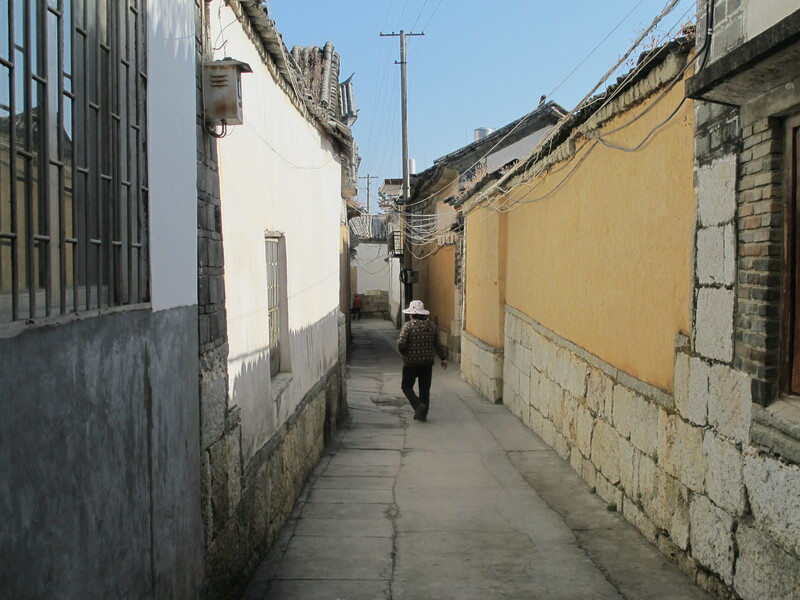 Our travels took us past the sixth ring road to this Ming Dynasty Village, comprising 5.3 square kms, which was built by a single, extended, family from Shanxi Province over 4oo years ago . 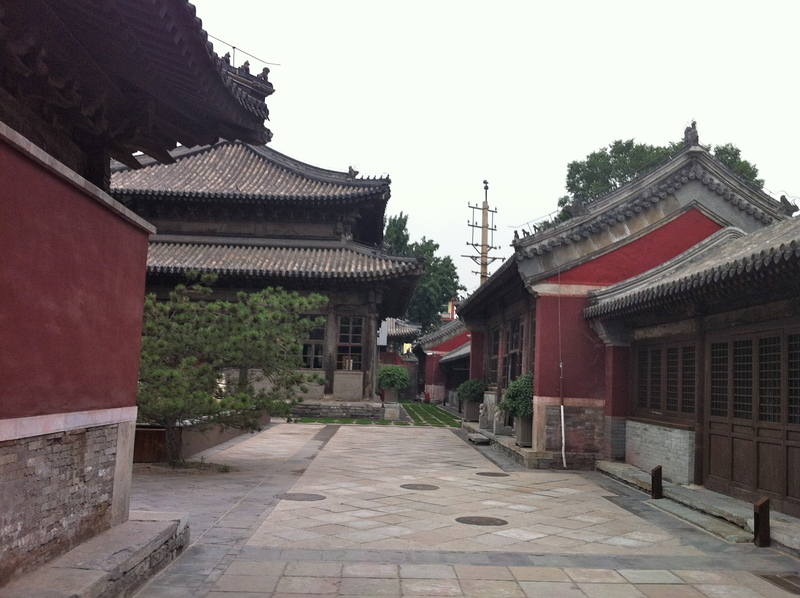 It comprises over seventy preserved courtyards with about 680 rooms. 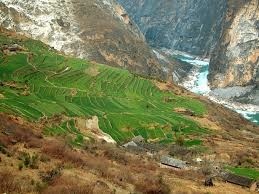 I am sure a weekend away at Caundixia would be nice and also very relaxing in the evenings as there is not much to do. 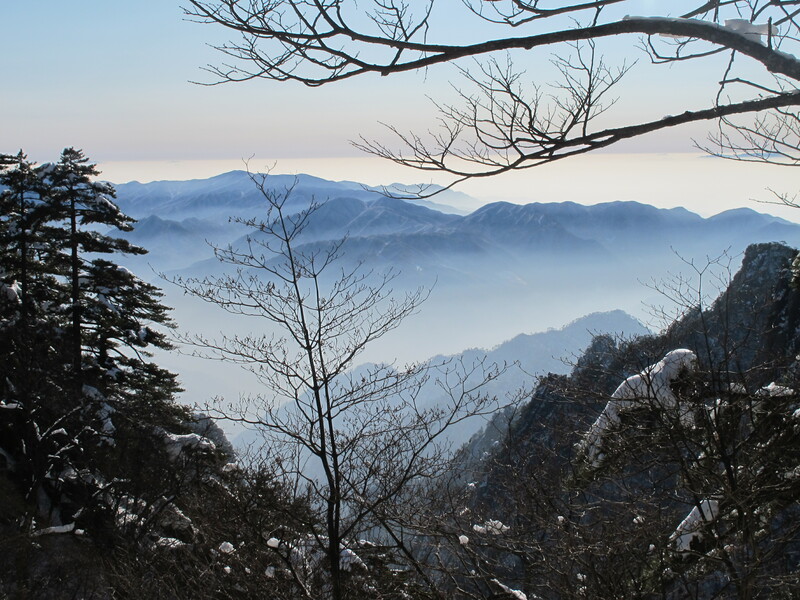 Perhaps a walk around the surrounding hills, enjoy a home cooked meal and read a book before falling asleep on your kang stove bed. I am told toilets are communal!! Some of us took up the offer of dining and enjoyed Chinese food from a rather cute little restaurant where we sat upstairs under a large apple tree. We were lucky to have a wonderful breeze every few minutes as it was a rather warm day. One of our party utilised his wonderful language skills and read the Chinese characters (Hanzi) on the menu which allowed for great dishes to be ordered. We returned to the courtyard home I had seen in winter that had a sign selling jars of honey, only this time we were able to buy some fabulous tasting honey for 50 RMB. 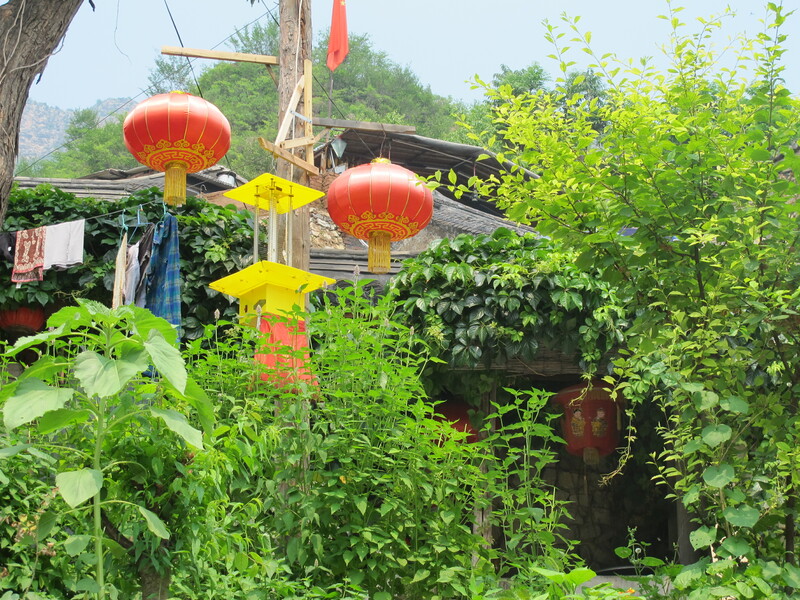 And lots of my very favourite things; Chinese lanterns – all hanging throughout the village. 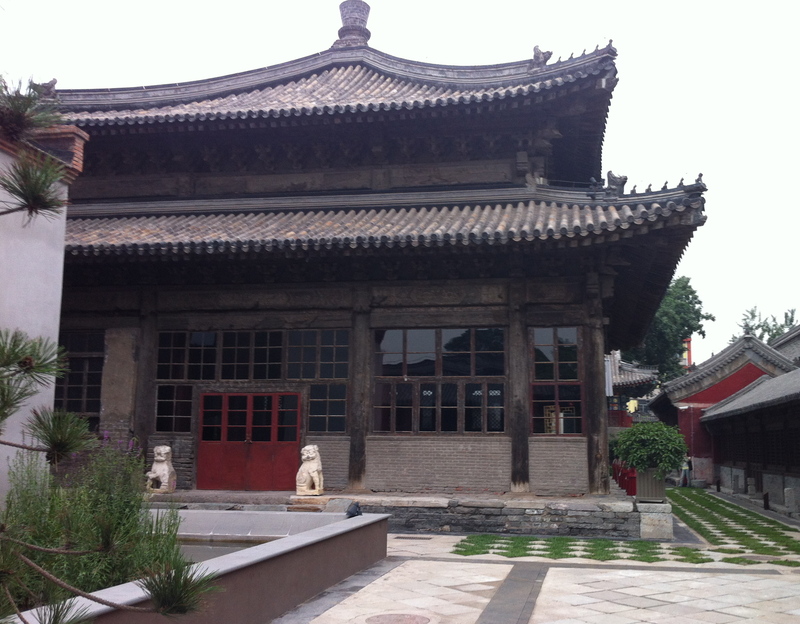 A restaurant I have recently tried is one set in a 600 year old Songzhu Temple complex. 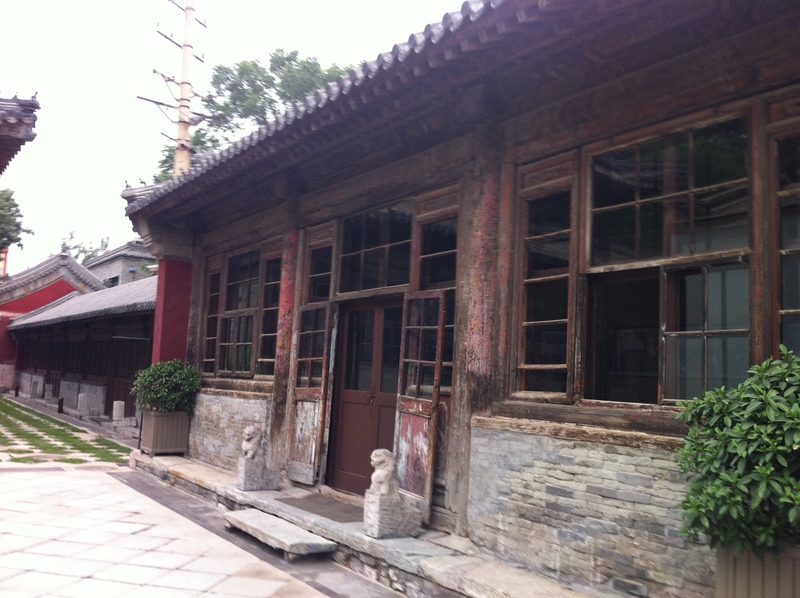 A little history on the complex – during Emperor Kangxi’s reign (1661-1722) the complex was home to many Buddhas. In 1950 it became home to Beijing’s first black and white television factory, then a zero-star hotel. 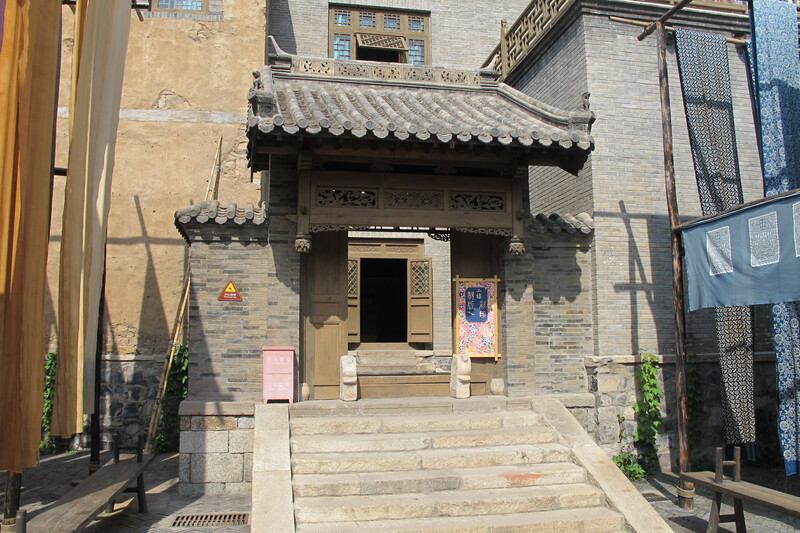 Parts of the temple were destroyed during the Cultural Revolution and in 2008, renovations commenced on the main temple which is located at the back of the complex and only used for private functions and events. 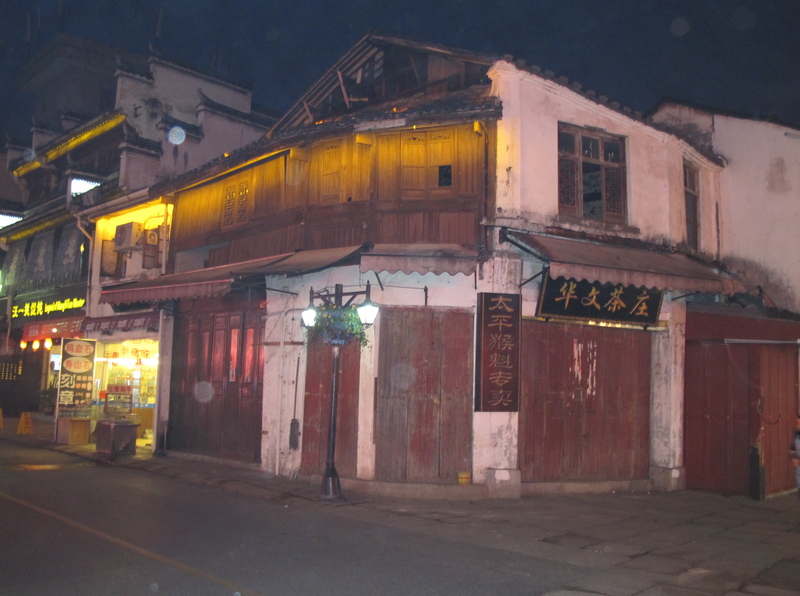 During its four year refurbishment process, only historically accurate building techniques were used to preserve the history and keeping of the original structures. The actual restaurant was designed by an Australian architectural firm and is located in two temples which are linked by a small walkway. 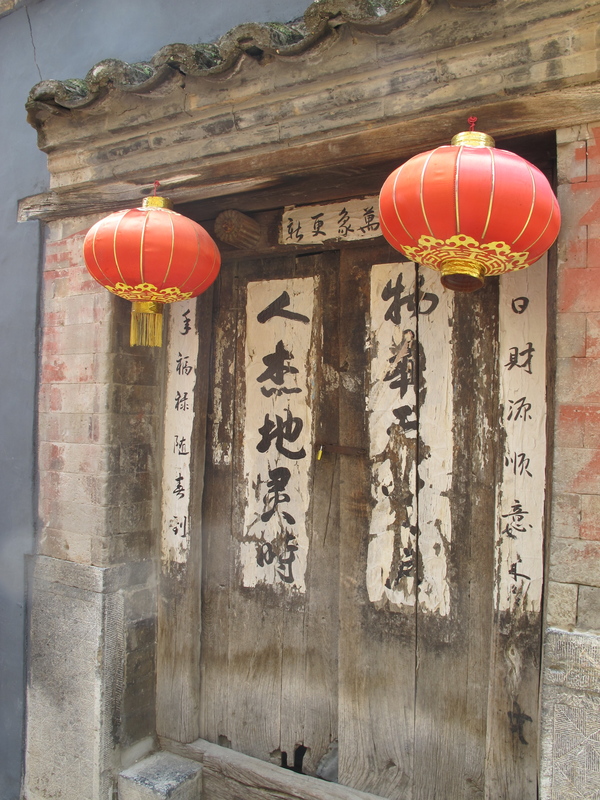 The entrance and bar pass through one of the original temples with arched doors and timber ceilings. The main dining area is a new structure that was once the television factory. 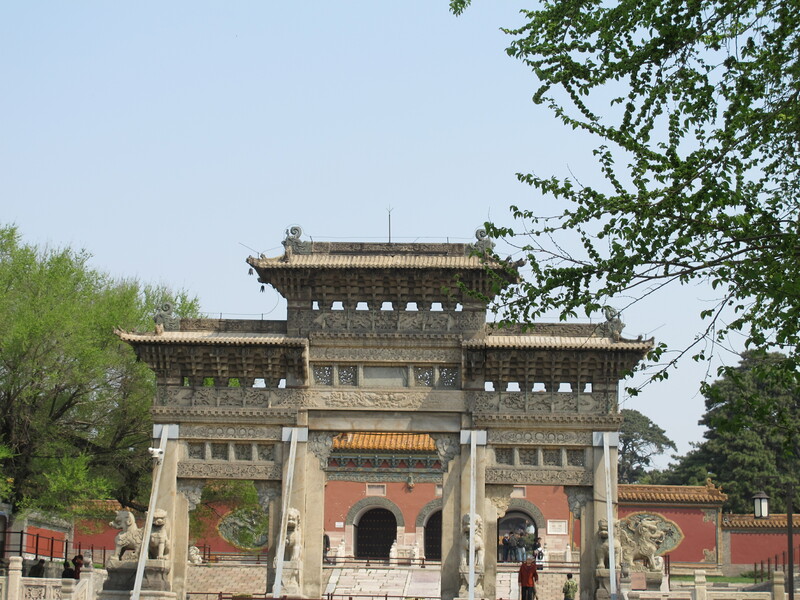 Definitely arrive early, or take a walk during the evening, to see the grounds which contain the main temple, ancient halls of worship and factories constructed after the Communist takeover. 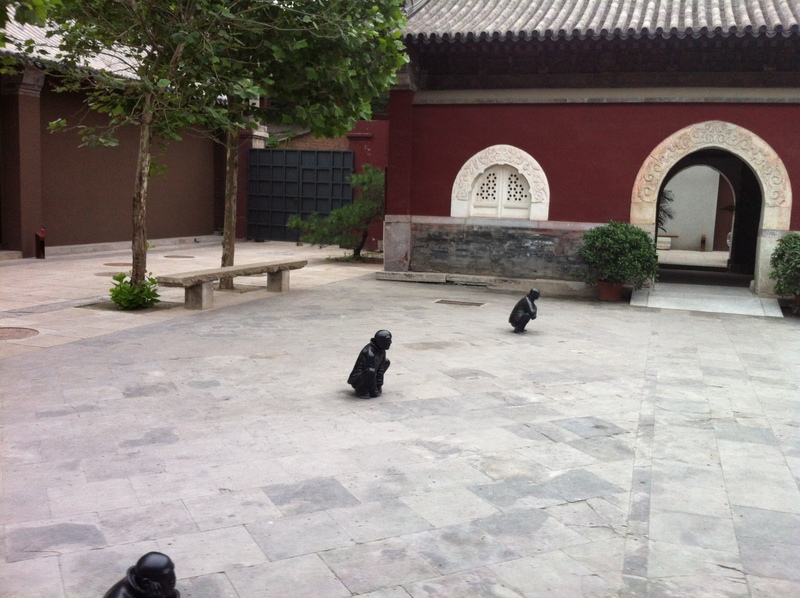 The little crouching men around the courtyard are very cute as are the warrior like statues along the side of the main temple. BTR serves contemporary European cuisine. We chose the Tasting Menu and I am told the olive oil poached cod with a black truffle crust was excellent as was the cream of mussel soup with saffron. For me, the vegetarian menu was diverse and one of the best in Beijing and I loved the mushroom ravioli. Throughout your meal you enjoy little surprises such as tiny cheese puffs and a palate cleansing sorbet just before dessert. Dessert on the Tasting Menu is ok but I am still a fan of Capital M’s pavlova or the Mille-feuille. As you depart, another little surprise – a small take-away gift – a little box containing a pot of home made jam! 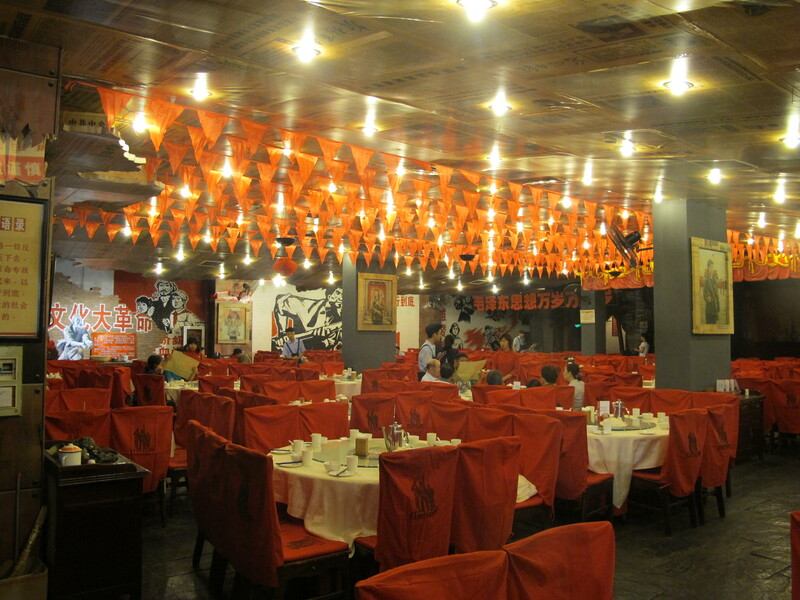 The restaurant’s Belgian proprietor used to manage another fab Beijing restaurant – Maison Boulud. 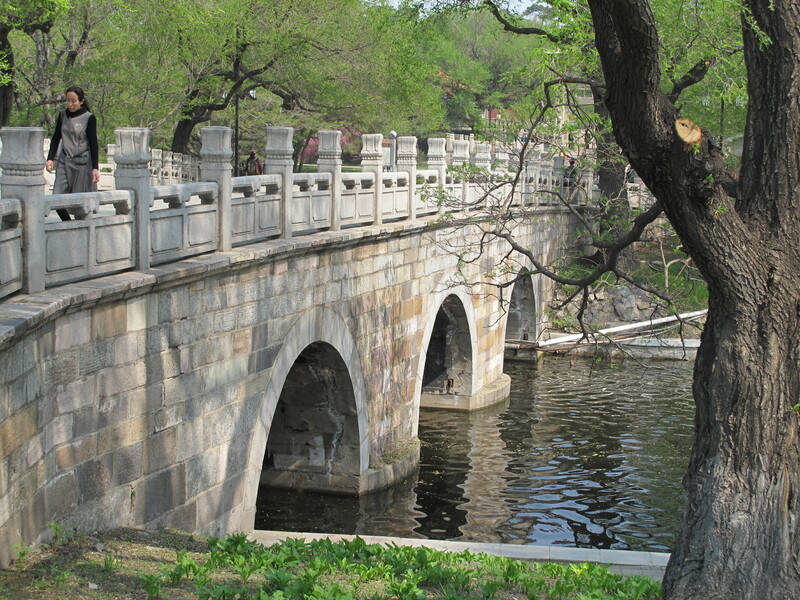 TRB is located behind the Forbidden City, at the end of a Hutong and is a little difficult to find, but definitely worth the effort. Only four parking spaces at the restaurant so try and get there early to get a spot. 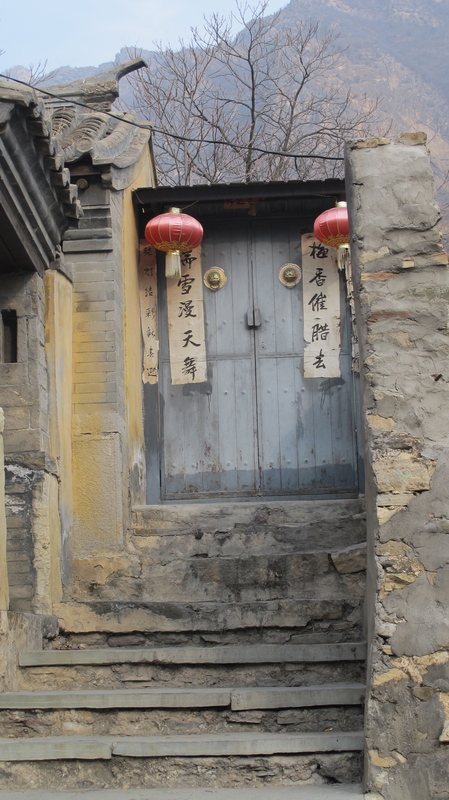 Driving up the Hutong has its usual problems. 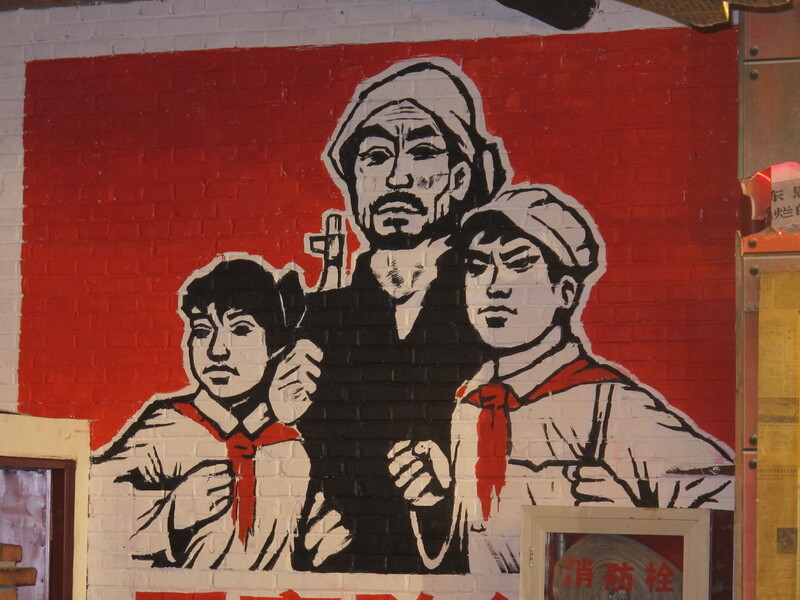 I heard about this interesting restaurant in Beijing that offers a taste of China’s revolutionary past and definitely wanted to check it out, so with help from my trusty event assistant manager, Renee, I organised an evening to travel out to the Fifth Ring Road with twelve other comrades each of us wearing obligatory Chairman Mao caps. 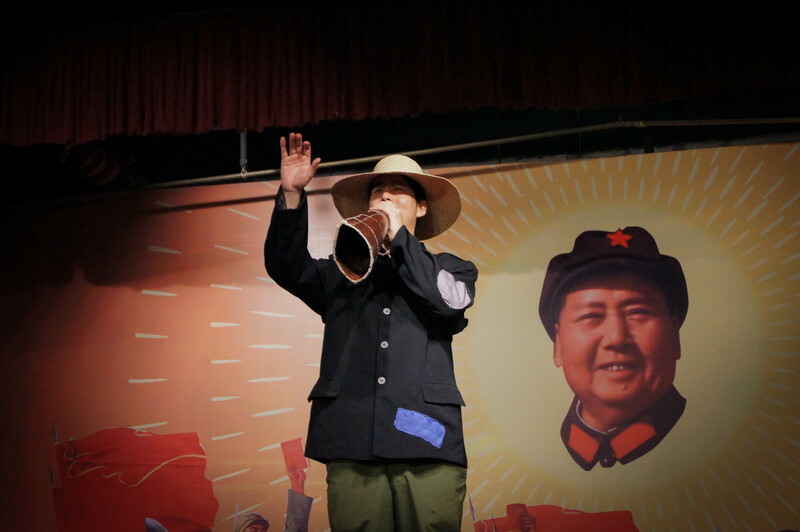 One of our comrades tried not to toe the Party line and removed her cap…but as Chairman Mao would say ‘ be unto your Comrade like a warm spring day’ – (clearly this does not fit this situation but it’s all I could find) so a quick reprimand and the cap was back on!! 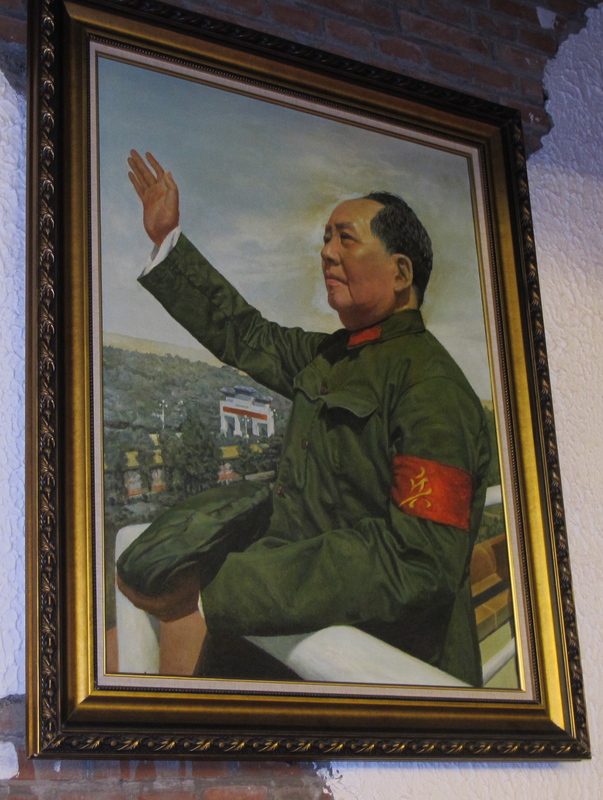 The decor is very revolutionary in fact over the top Maoist. 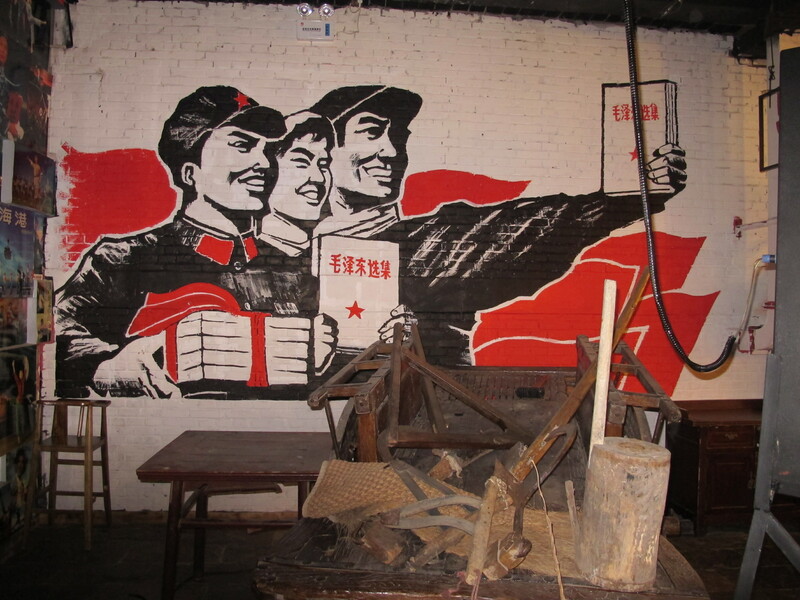 Slogans, revolutionary posters, old newspapers from the cultural revolution period, red flags and very large pictures of the Chairman. We all expected the food to be basic but were in for a wonderful surprise. 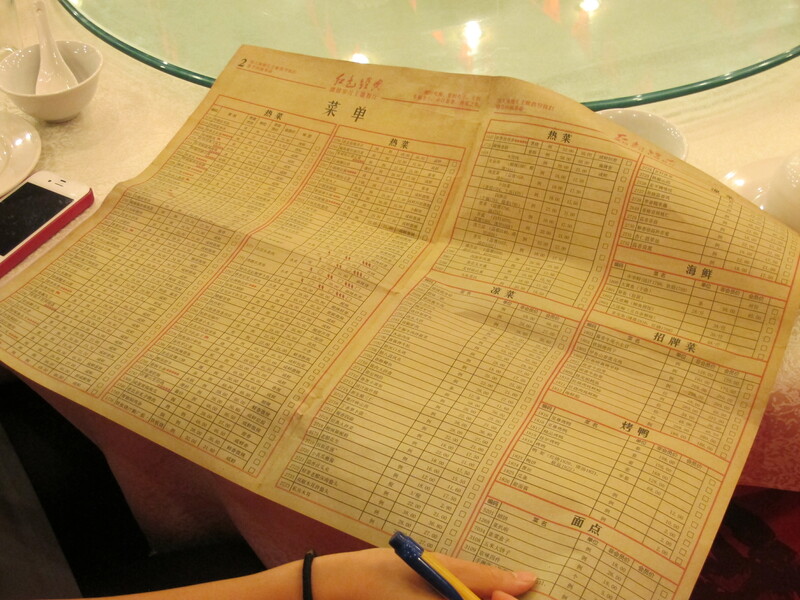 The food was delicious, ordered by Renee as the menu is completely in Chinese characters. 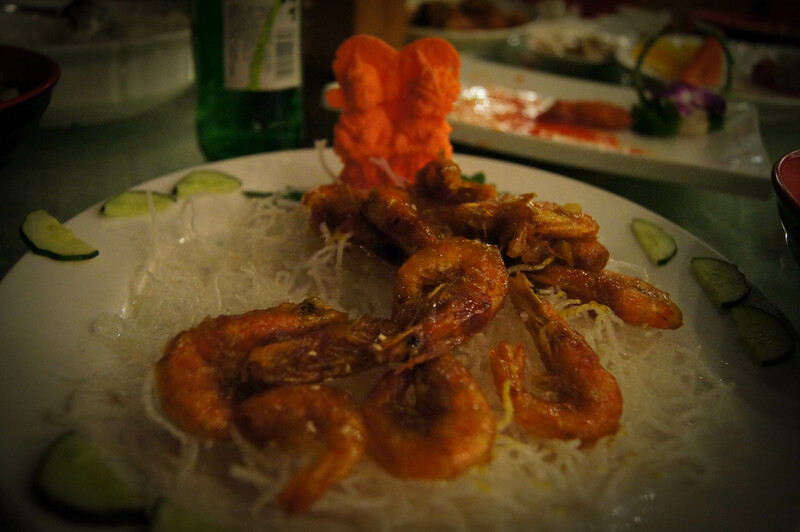 Fish, eggplant, prawns, beef, tofu; all eaten with red French wine and local beer and served by waitresses in pigtails tied with red bows wearing workers suits. 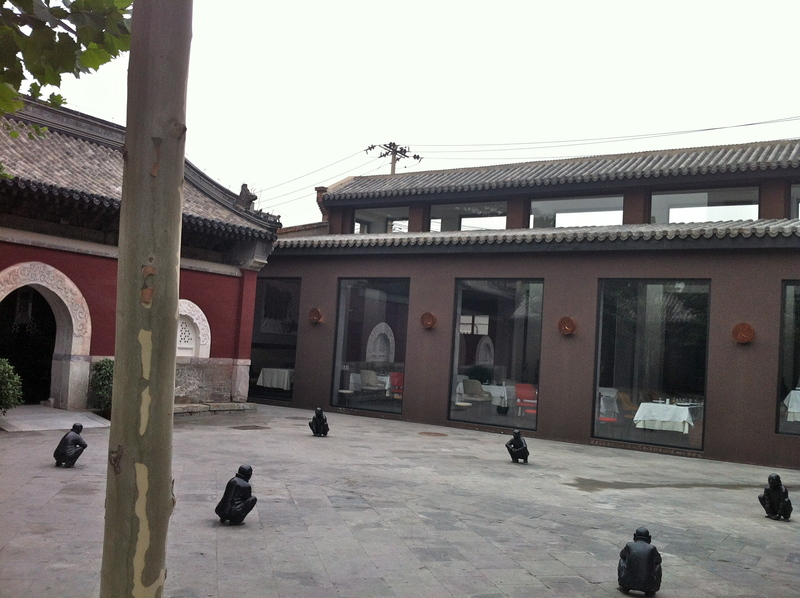 There is a minimum table cost of 900 RMB but with seven of us on each table we did not find that to be a problem. 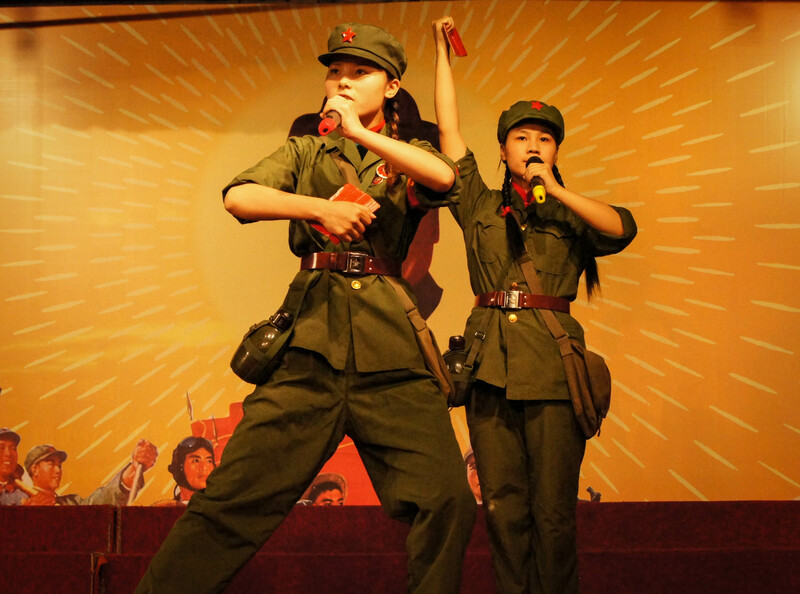 The revolutionary era song and dance performance started around 7.30pm and old anthems and cultural revolution songs were sung with gusto both from the staff and the Chinese restaurant patrons. Us Aussies tried our best but none of us recalled any of the songs being on the top 40 so had limited input. One of our party strongly believes that a couple of the more peppy songs will make international hits – I am still to be sold on that one!! 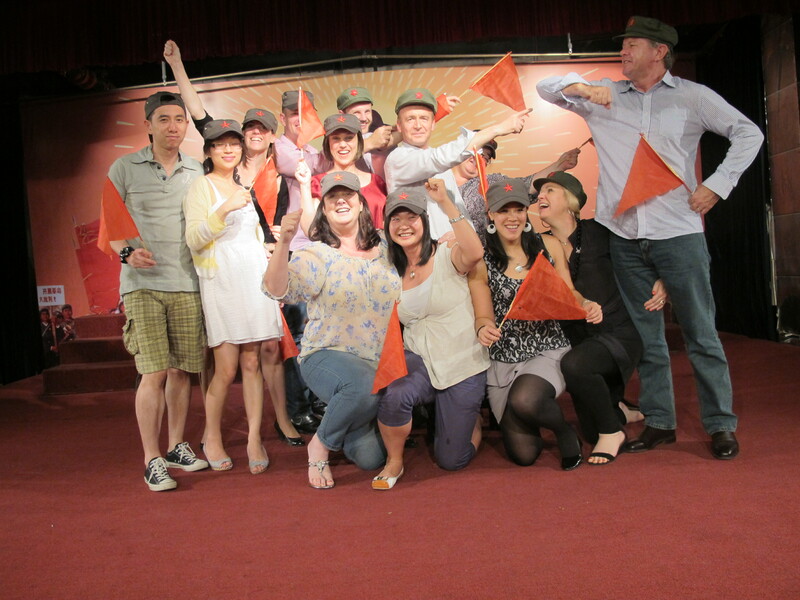 Prior to the performance each of us was given a red flag to wave which we did with gusto. A special part of the evening was from my comrades who organised for the staff, and joined by restaurant patrons, to sing me a birthday song ; twice in English and twice in Chinese . Now this was very much a surprise because my birhday is not for another three months [but I think my comrades knew this – thank you my friends]. So I blew out my candles, ate my longevity noodles and smiled a lot. At the end I stood up and bowed and thanked everyone in Chinese; of course the elderly Chinese patrons thought this was ‘amazing’ and I received a rapturous round of applause. Thanks comrades!! You need to book for this restaurant and it’s worth going with a big group; lots of laughs; good food and great memories. 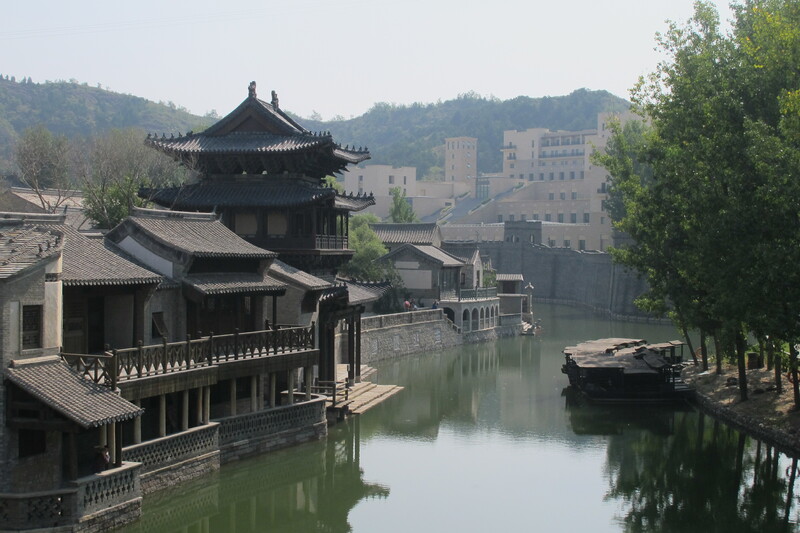 Another weekend; another place in China to visit. 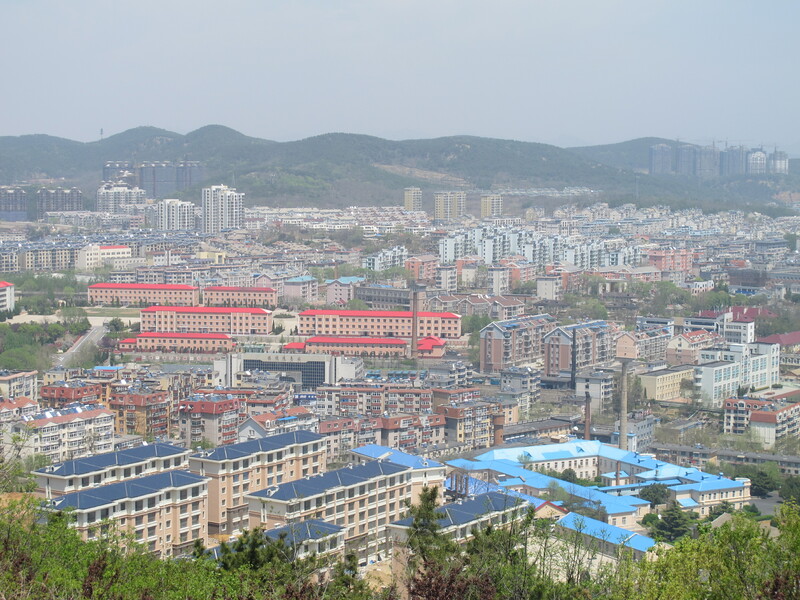 After a couple of days working in Shenyang and Dalian in Liaoning Province, I decided to stay and spend two days in Dalian. One of my Chinese teachers, who was born in Dalian gave me some great ideas of places to visit; I of course then used Global Easy Tours to transport me. 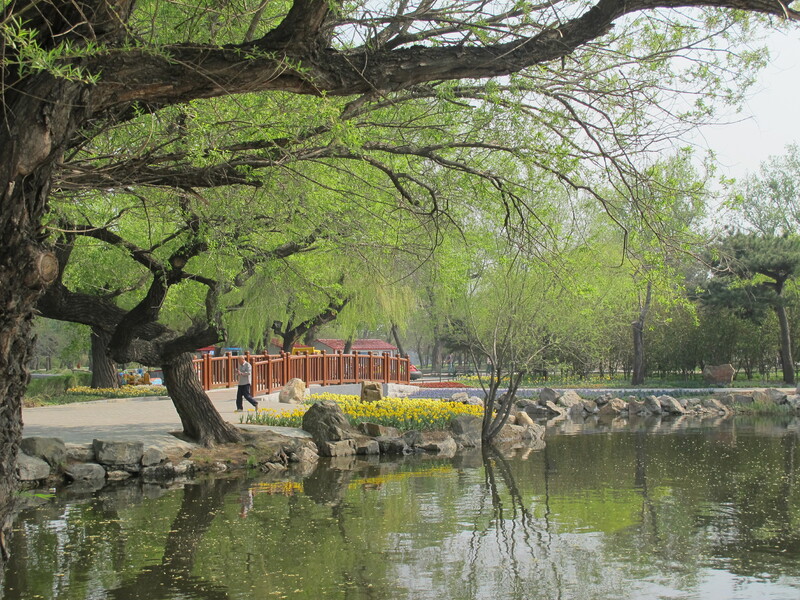 But first before work one morning I walked to Beijing Park which is one of the most beautiful in Shenyang and its most famous. You could easily spend a full day walking around the park but as I had to get to work I did a quick walk around and visited some of the famous sights. 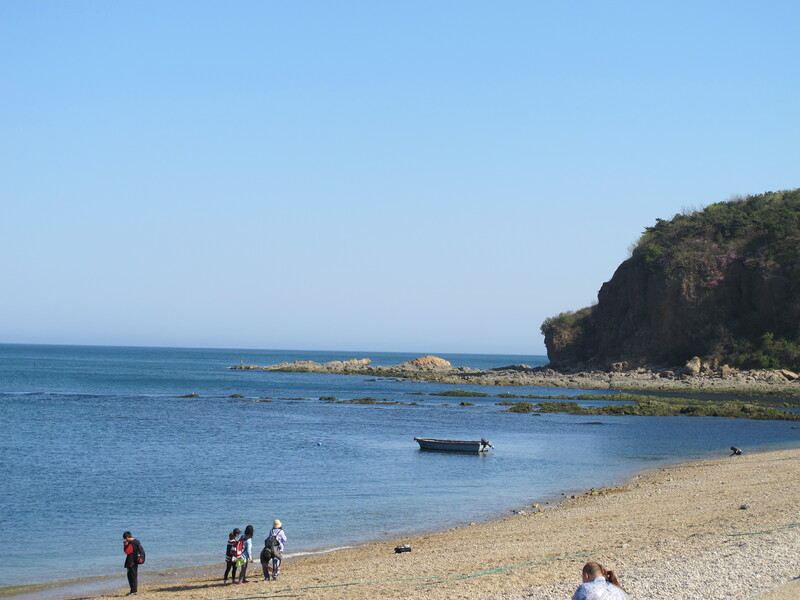 Our first work day in Dalian: After taking the fast train from Shenyang to Dalian our wonderful police compatriots took us for a drive along Binhai Road which reminded me of driving along the Great Ocean Road in Victoria – very beautiful. 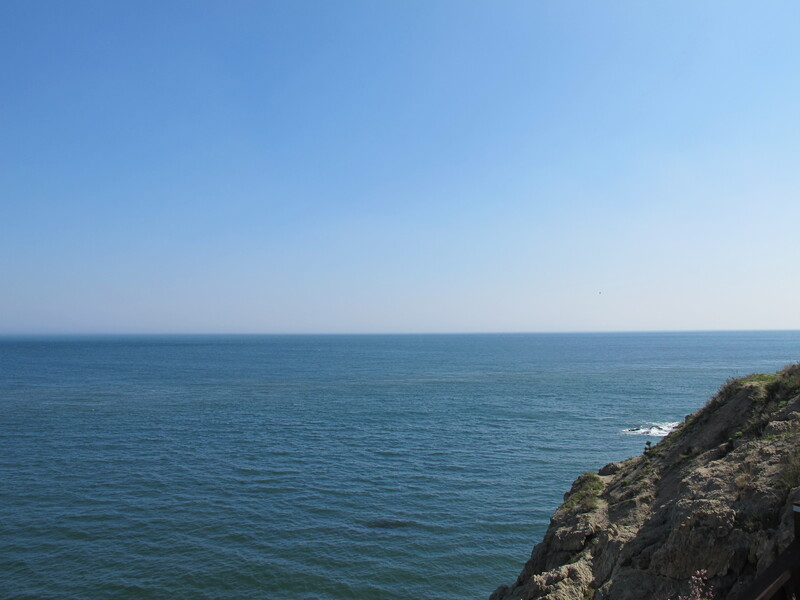 I could not believe I was in China, mountains one side and the ocean on the other and of course clean fresh air coming from the sea. Then a quick drive down to the beach which reminded me very much of my place of birth; Wales with the absence of sand on the beach and covered in small shells and pebbles. 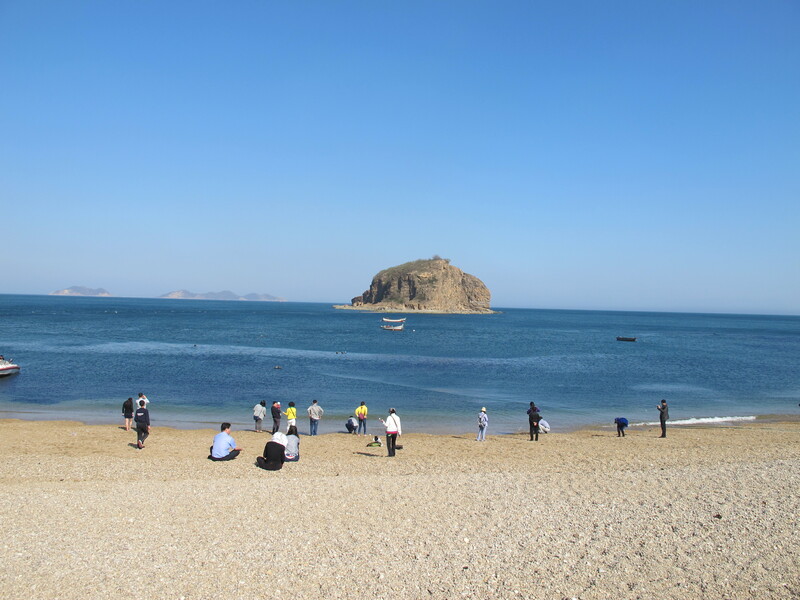 I went down to the sea to put my hand in and promptly fell in – quite embarrassing as I was being accompanied not only by my Beijing team but also by about twelve local police and wearing office wear!! 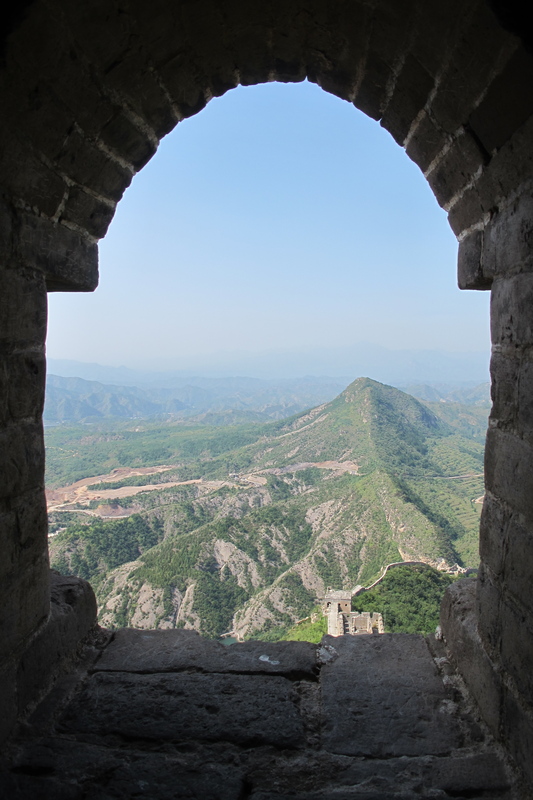 Weekend: Firstly a day long tour to Lvshun, previously known as Port Arthur and Ryojun, and located at the extreme southern tip of Liaoning Peninsular. 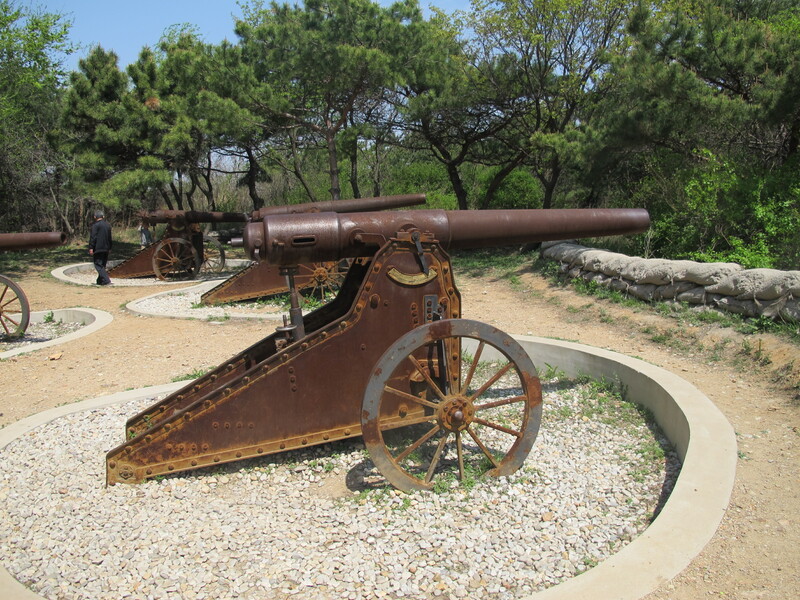 Lvshun was previously under Russian administration and then Japanese administration so my first stop was to Dongjiguan which was the main battlefield of the Russian-Japanese war in 1905 where the Japanese beat the Russians in a naval battle. A very interesting place with matching history which is a great visit for both war history buffs and families. Next stop was to the Russian-Japanese prison which was half built by the Russians to intern the Chinese and rebuilt by the Japanese in 1907 to intern the Chinese, Russians and dissidents from Japan opposed to the emperor. Finally the communists used the prison to house the Chinese. Poor Chinese really don’t get a break in this prison. As prisons go, this one is quite morbid with torture rooms and a gallow with skeletons on display. Maybe not for the kids!! 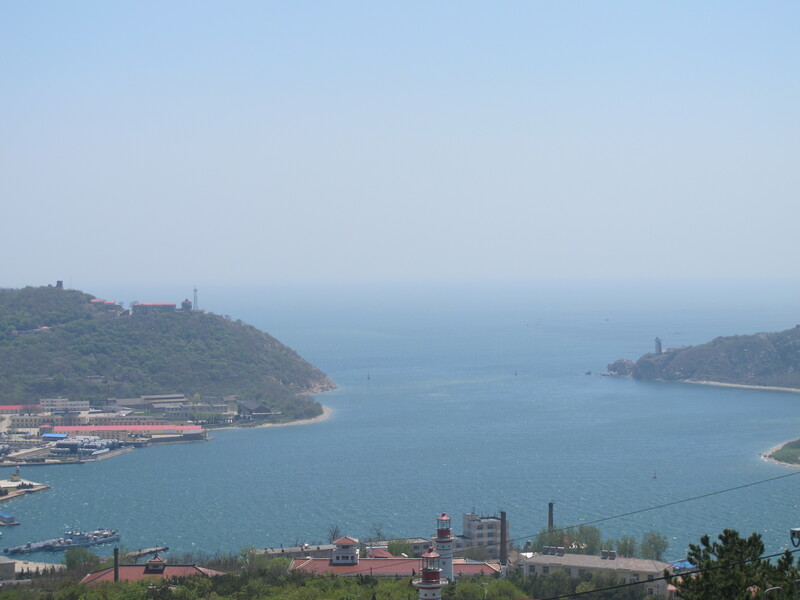 Last day in Dalian: A drive to Baiyu Mountain to see spectacular views over Dalian both the city and the ocean, then to visit a local cherry blossom park with a beautiful dam. I also visited the Russian Street and the Japanese Street. The Russian Street had lots of stalls where you can purchase many things but mainly guns (not real) and babushka dolls. The Japanese Street had many old Japanese houses which were quite lovely. 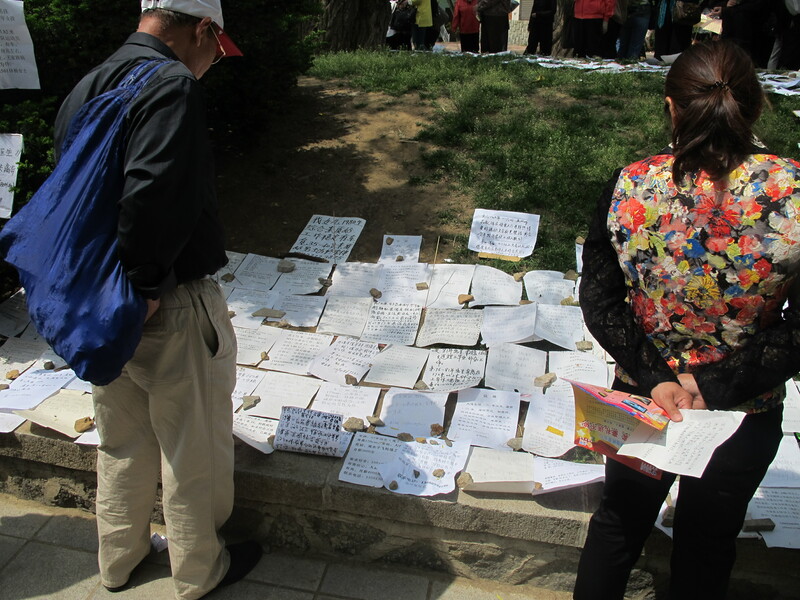 My last stops before the airport were to a park which on the weekend is used as a dating site – where parents (mostly mums) write out adverts for the type of partner they want for their children. If only it wasn’t in Chinese I might of found myself another husband. Then to Lovers bridge where the Dalian people walk along after they are married to ensure a long and lasting marriage, and finally dragon park and one of the many squares in Dalian where I saw the imprinted feet of the now imprisoned BO Xilai, who lived and worked in Dalian years before his arrest. 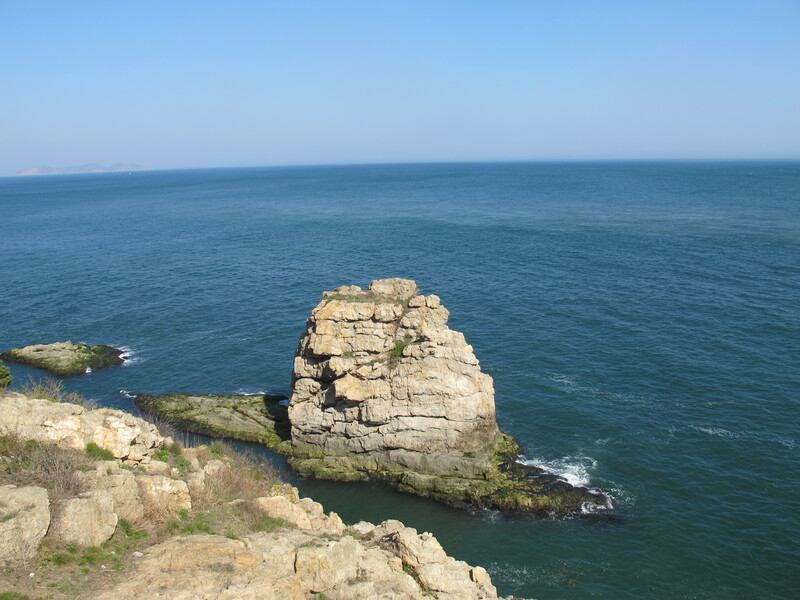 I really liked Dalian, it’s got a great feel to it; it’s a beautiful city with spectacular ocean views; a definite place to visit. I stayed at the Shangri-la Hotel which was great and one evening a little Chinese boy even put on a dancing display for me – gorgeous!! 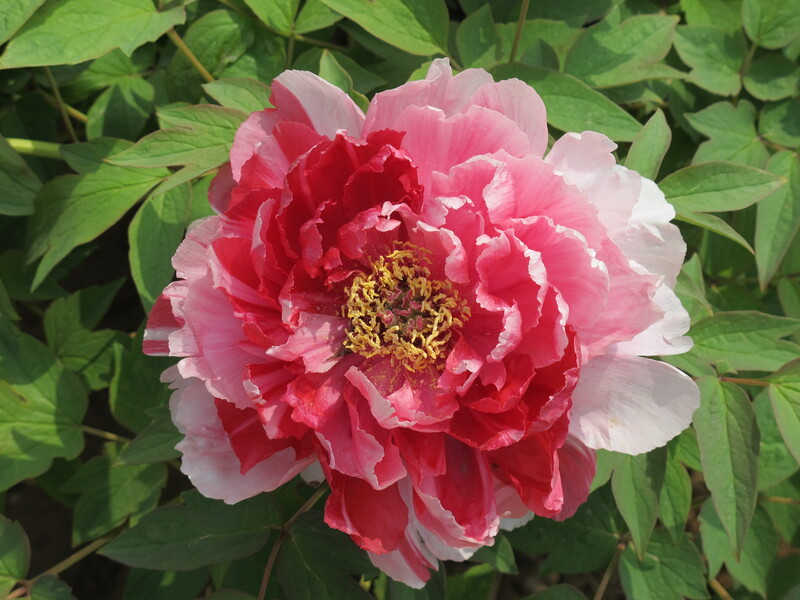 The Luoyang Peony Festival is held in Luoyang City every year from mid April to mid May. The festival attracts thousands and thousands of visitors and this year I was one of them. 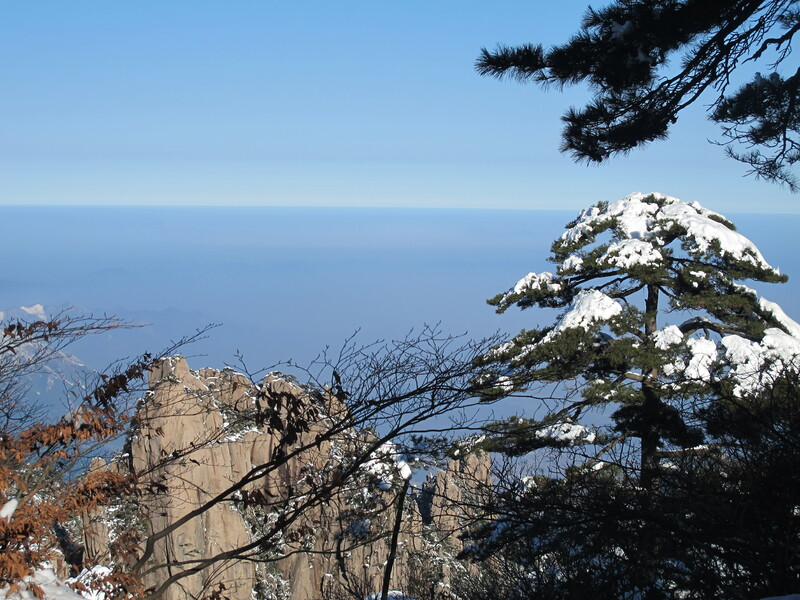 The flight from Beijing is just under two hours and once in Luoyang there are many other famous sights to see. 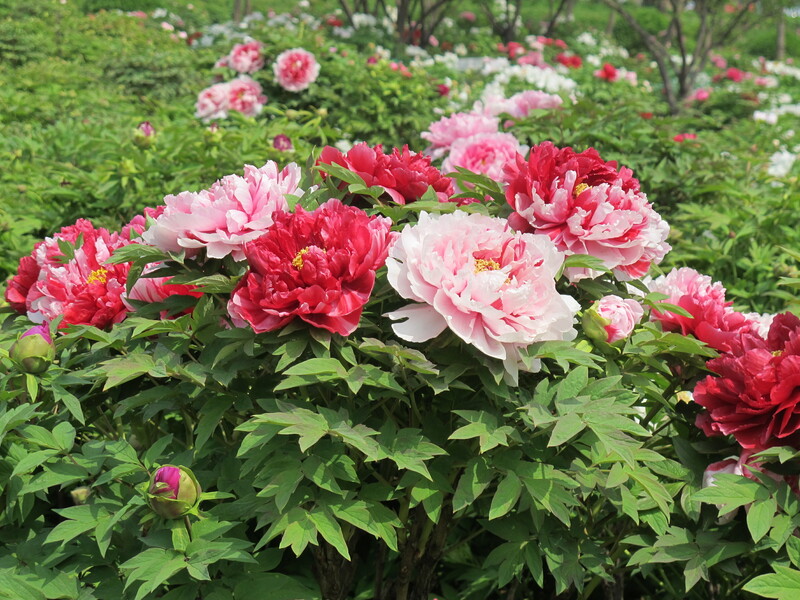 But firstly more on the peony festival – it is the emblem flower of Luoyang and it is said that since the Tang Dynasty, no other Chinese city has been able to rival Luoyang in growing peonies. 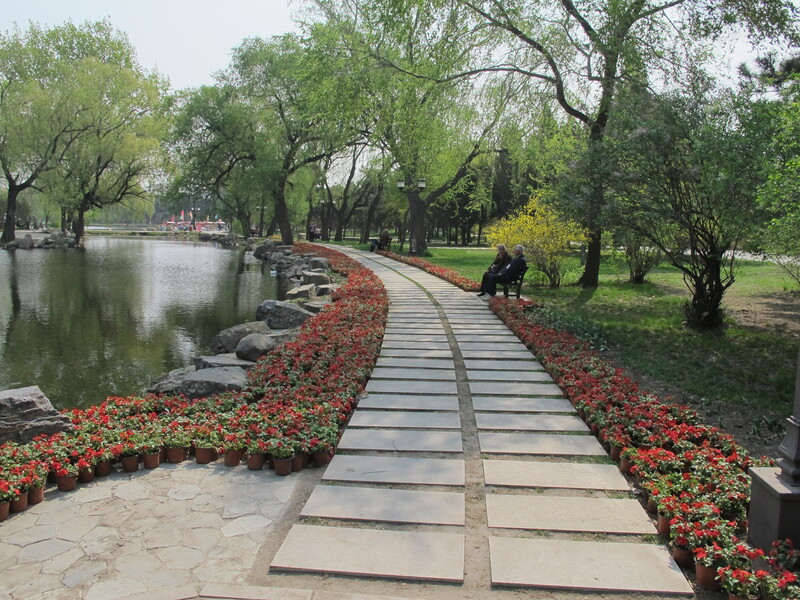 There are over thirty-five peony gardens in Luoyang and I visited two. 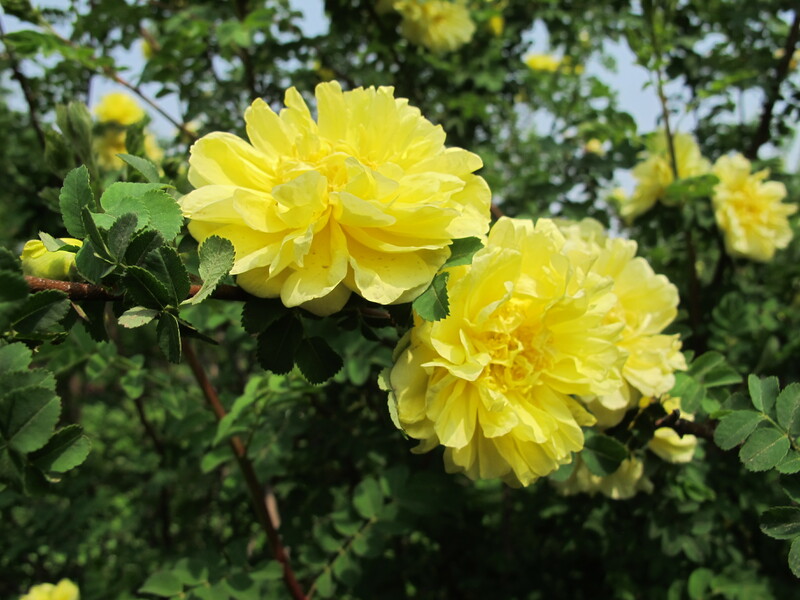 Unfortunately on the day before I arrived there was a huge downfall of rain so many of the peonies in one park were without petals but on the day I departed, my tour guide took me to another park where the peonies were in full bloom and absolutely beautiful. 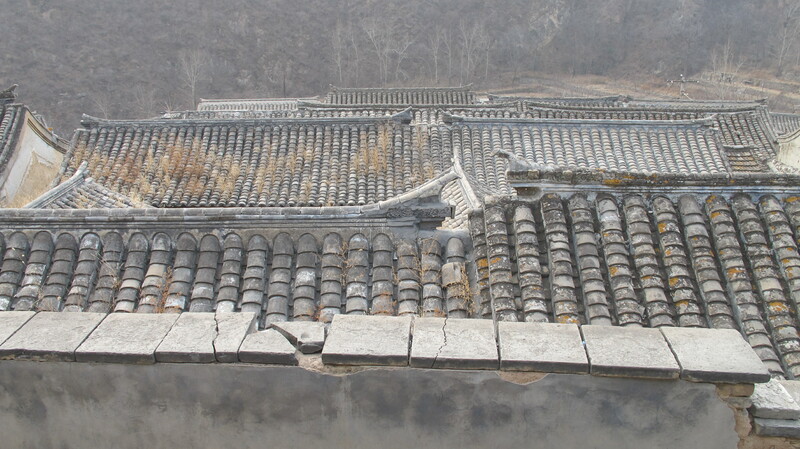 The Shaolin Monk Monastery is also located in Luoyang. 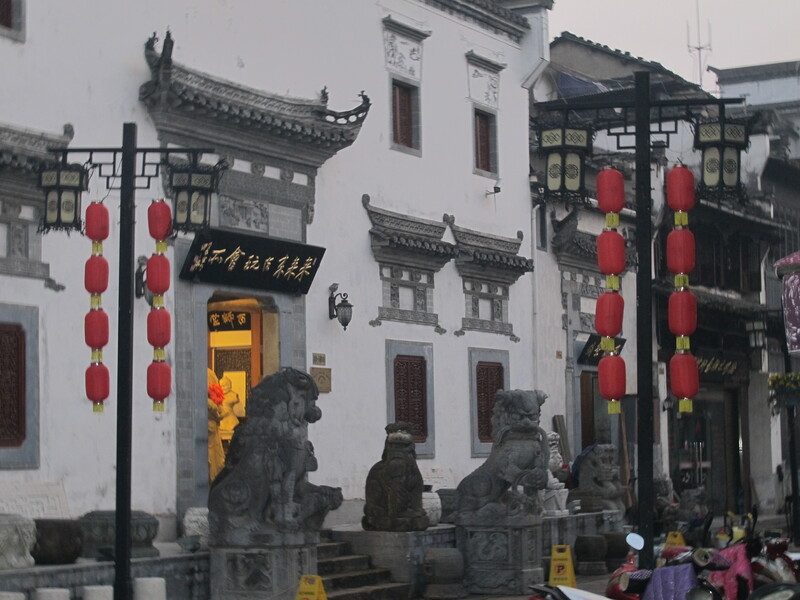 It was founded in the Northern Wei Dynasty and remains one of China’s oldest Buddhist Temples. 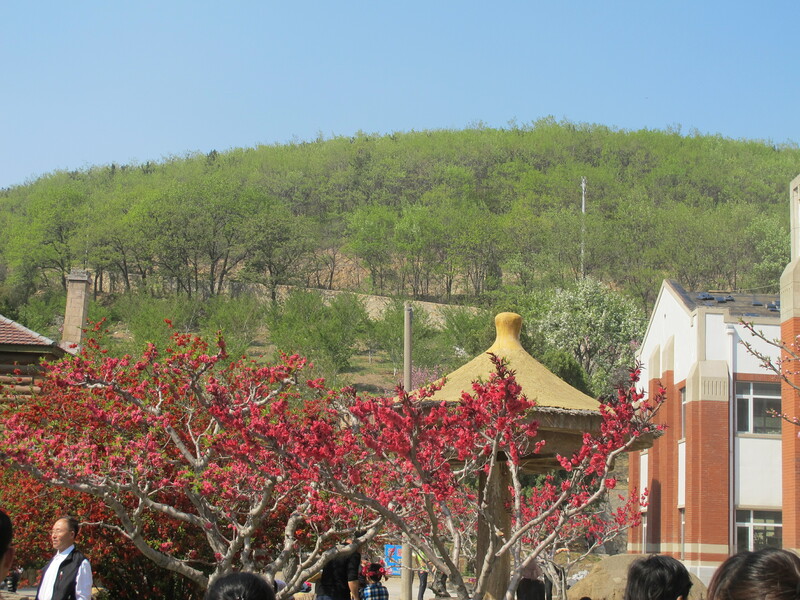 It is reputed to be the ‘number one temple under Heaven’ and is famous for its association with Chinese martial arts particularly Shaolin Kung Fu and Chan (Zen) Buddhism. 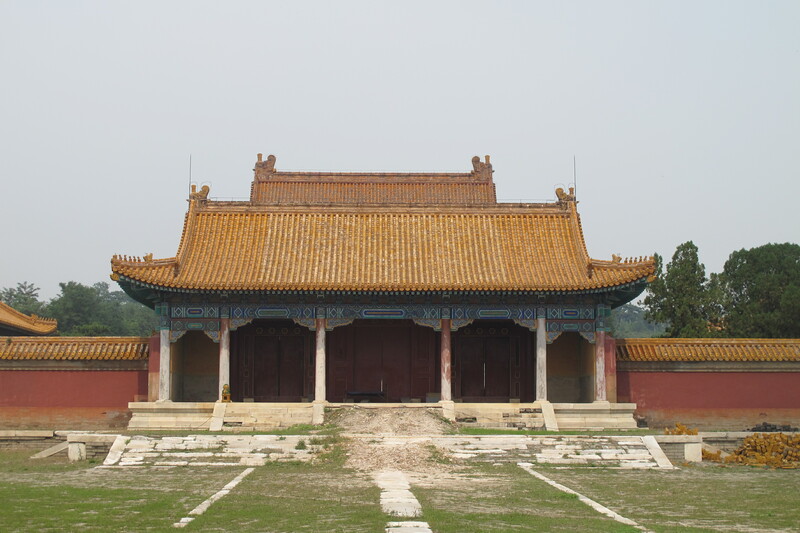 Thanks to Kung Fu movies it is probably the most famous Buddhist Temple known to the West. 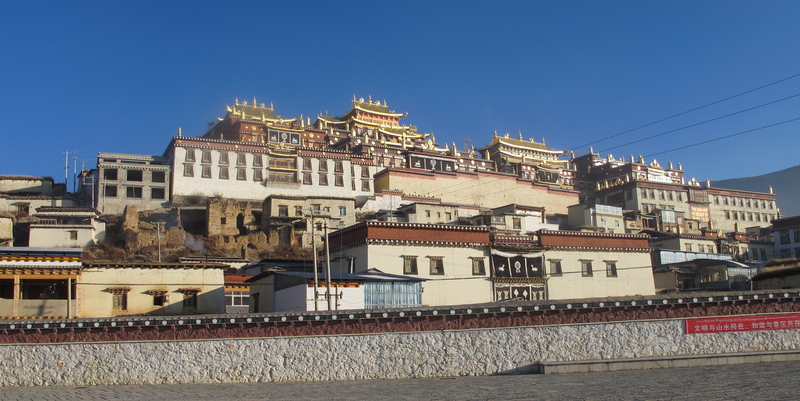 The Monastery has been destroyed and re-built many times and the current Monastery dates from after 1928 when it was mostly destroyed by fire. There are several overpriced souvenir shops within the Monastery which make the environment less serene but I guess money has to made from a variety of ways. 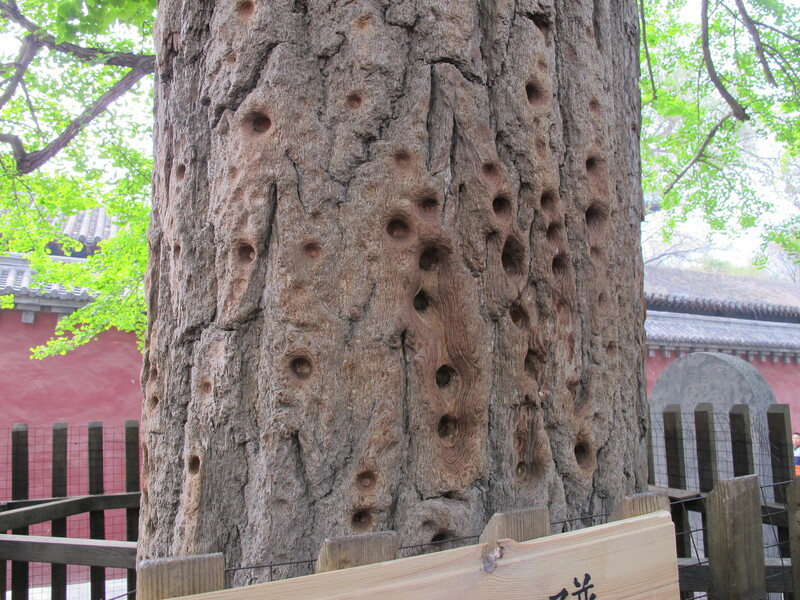 One of the most interesting sights was a tree used by the Monks to practice finger punching – it has deep holes in the trunk from the constant punching – amazing!! 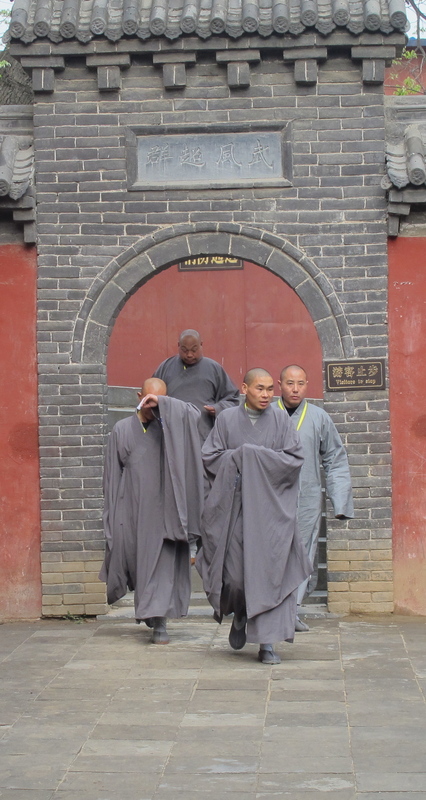 I am told that the robed monks at Shaolin are all highly skilled fighters but cannot be considered genuine monks. 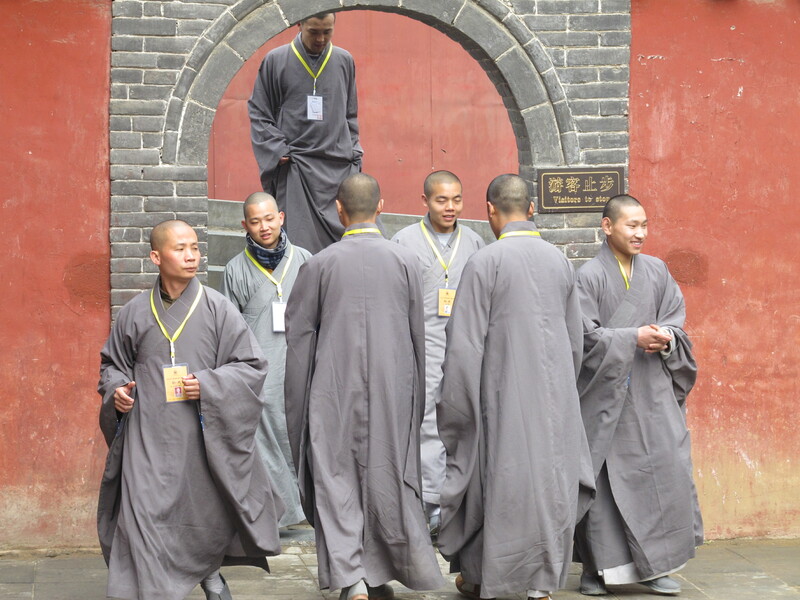 There are genuine Shaolin monks in China but they keep a low profile and are not found at Shaolin. 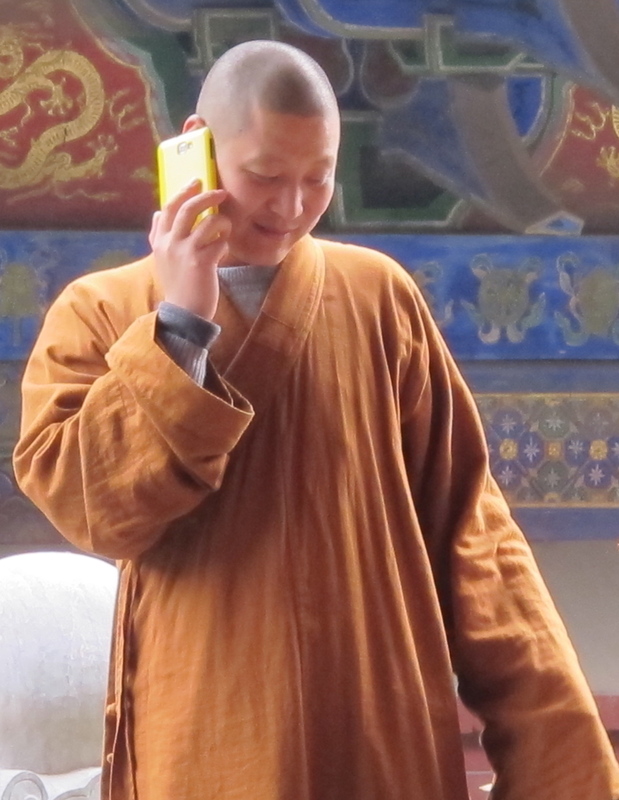 I am not sure how true this is but times have certainly changed for the Monks; clearly using modern communication devices is part of their daily life – I saw one robed monk using his mobile telephone in the grounds of the Monastery. 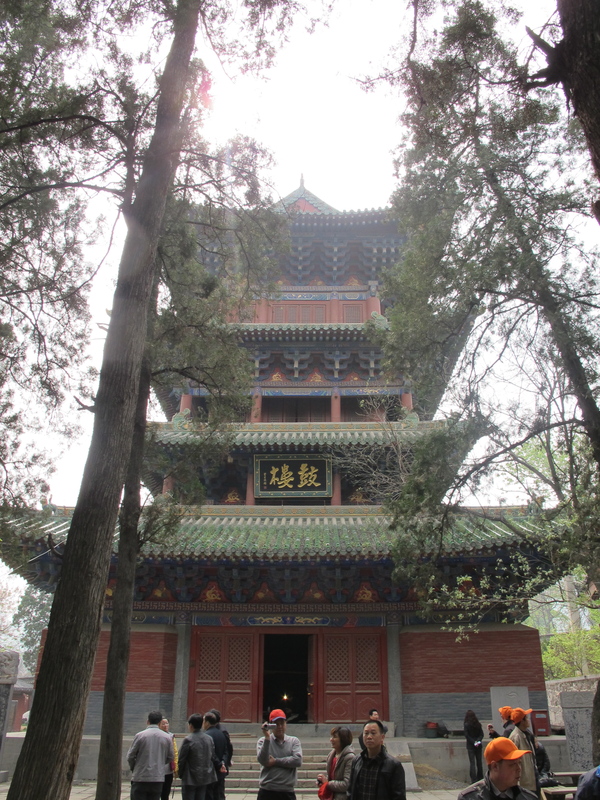 The grounds also include a Pagoda Forest, a graveyard for Buddhist dignitaries through the ages. 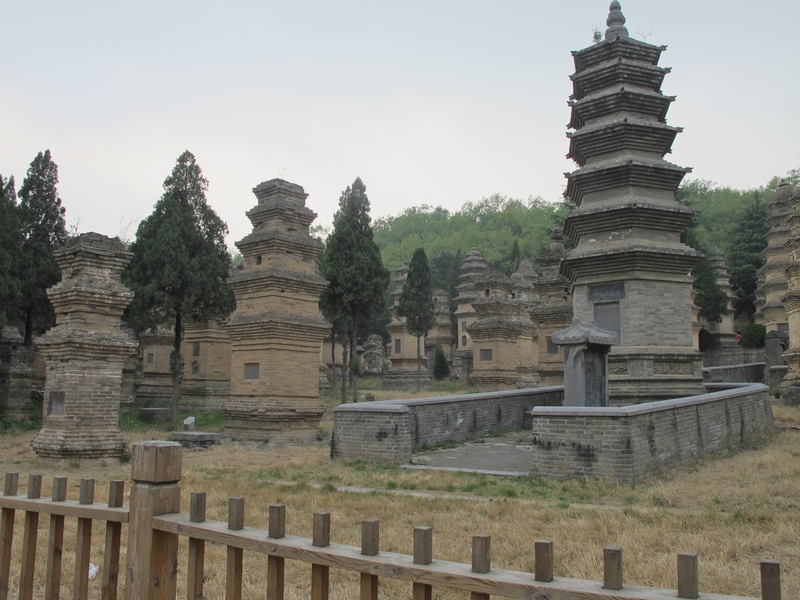 On average the pagodas are less than 15 metres high. 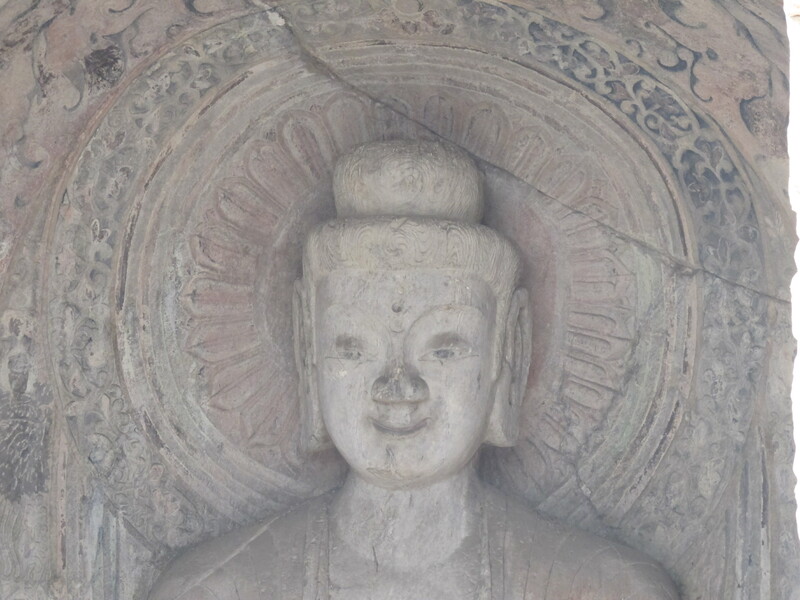 The layer and shape of a pagoda depends on several factors; a buddhist’s status and attainment and prestige during his lifetime. 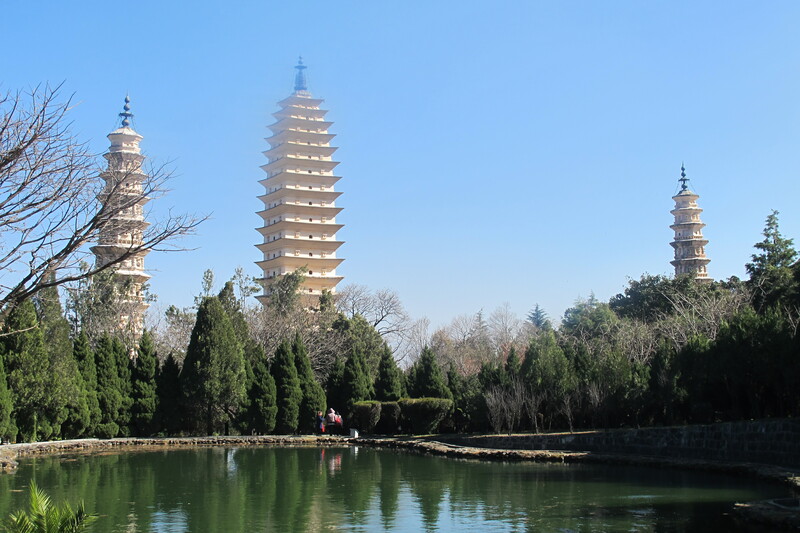 The Forest is the largest of China’s pagoda complexes. 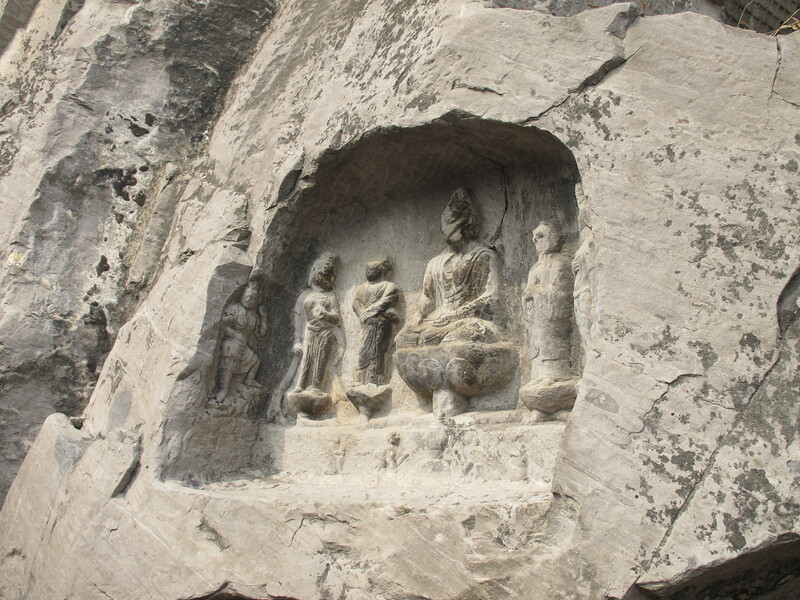 Another famous site in Luoyang is the Longmen Grottoes. My tour guide said that an early departure would beat the crowds….so not true!! I think there were as many tourists as there are statues – and there are more than 100,000 of these. I only saw one other group of westerners so we were the highlight of many a Chinese visitor’s day. I now know how movie stars feel with being stared at constantly – although a quick ‘Ni Hao’ from me brought smiles all around every time. 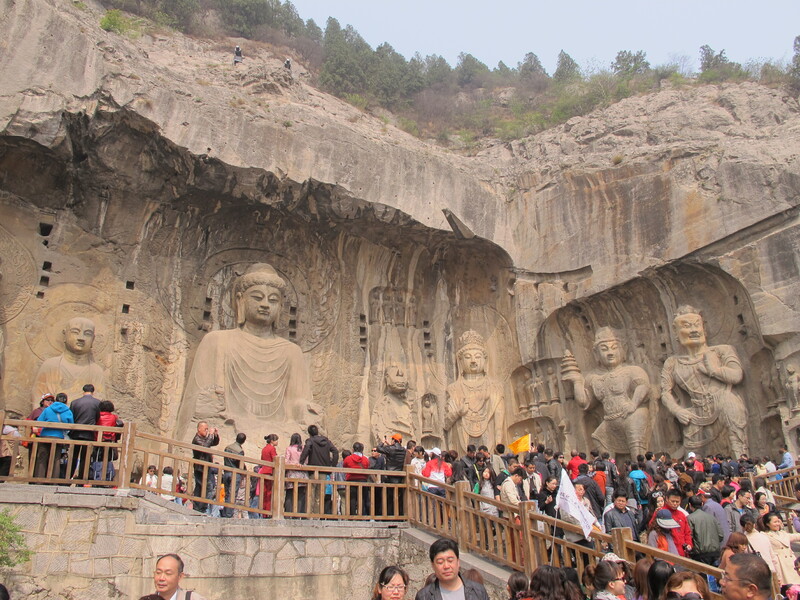 The statues are incredible; carved into 1400 caves and range from 25 mm to 57 metres in height. 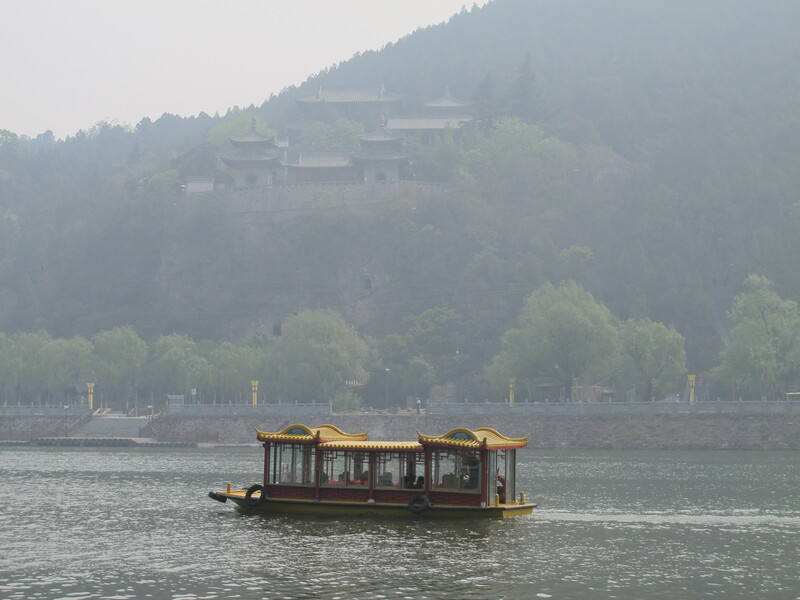 There is a little boat that for 25 RMB you can take to enjoy a ride along the Yi River, allowing for a long distance view of the grottoes. 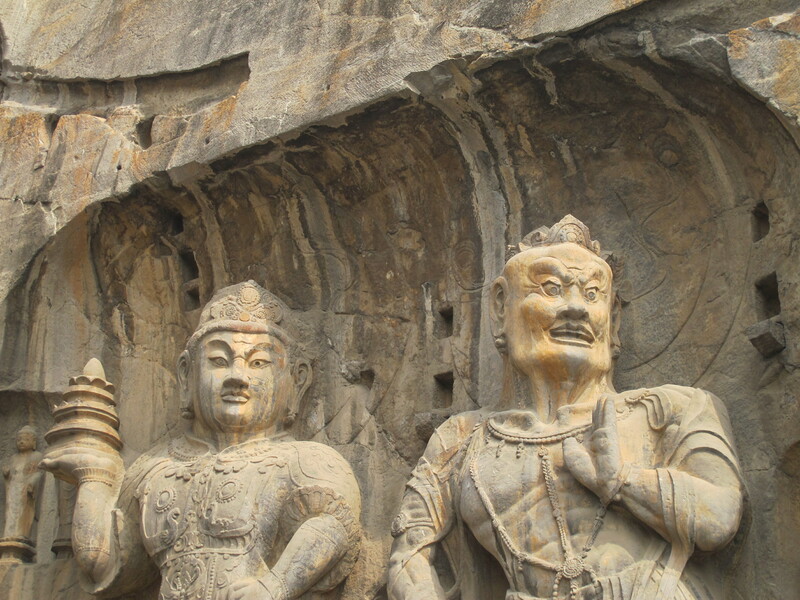 The Longmen Grottoes are similar to the Yungang Caves in Datong – having now seen them both, my preference is Datong – I just think they are more impressive! And maybe the best part of the trip – all flights on time – unbelievable but true. 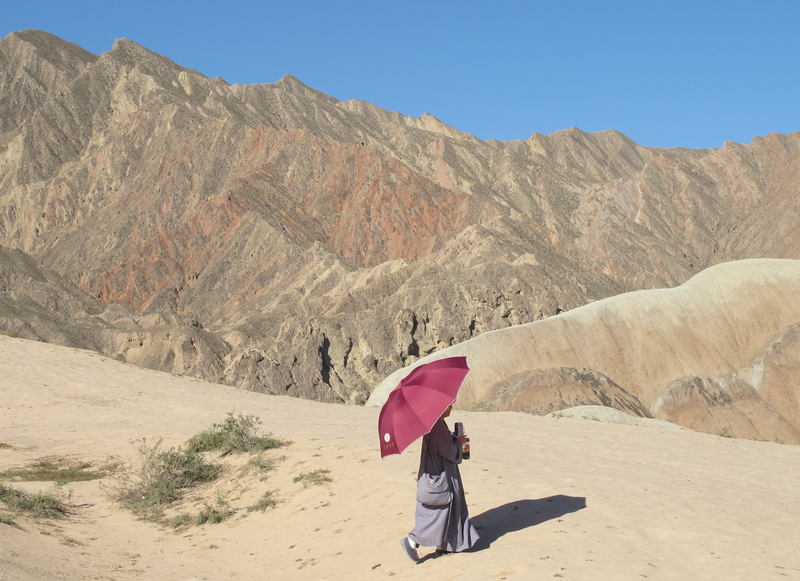 After leaving Beijing in January, I returned in September to do some further travel to Inner Mongolia and Gansu and to see friends. 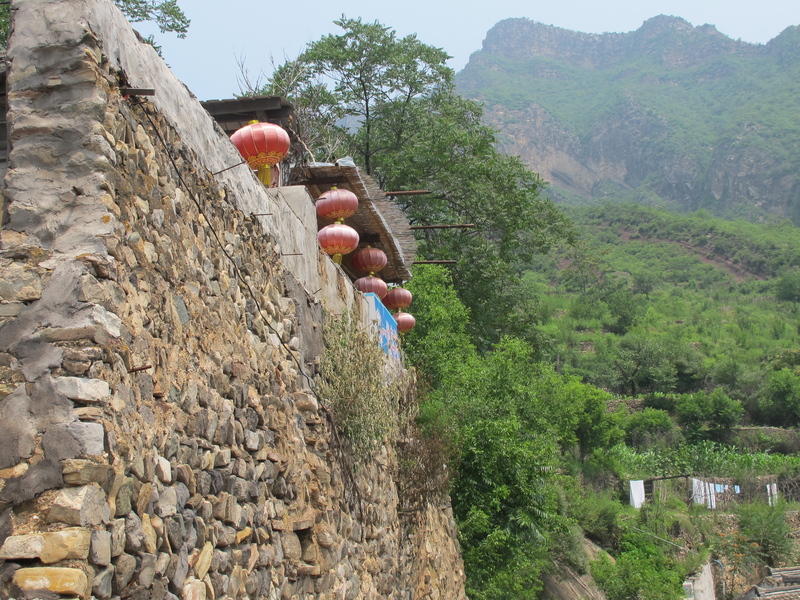 During my visit I took two one-days trips; one to the Eastern Qing Tombs and the other to Simatai Great Wall. As usual, I wanted to write about my trips and Frances very kindly agreed to publish my articles again for BB’s. I actually miss my monthly contribution to the Bits and very much miss my travelling around PRC and other nearby places. 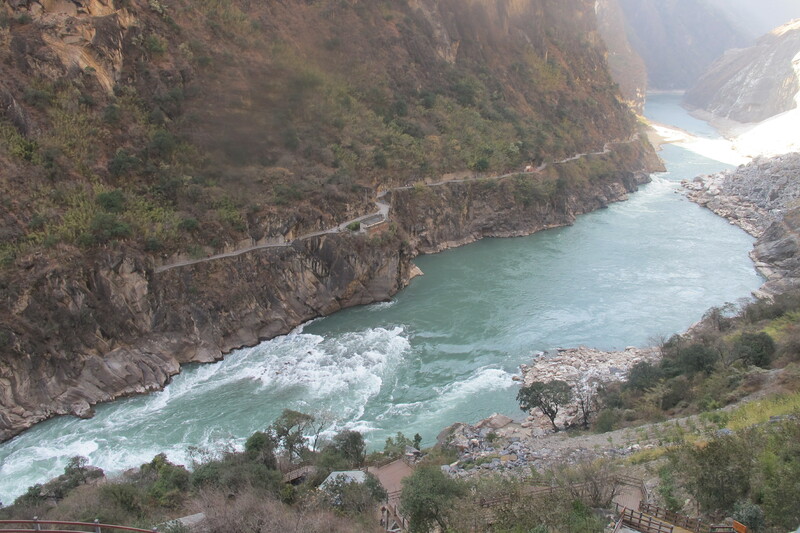 Back to my day trips…both places were interesting and scenic especially as I had not been to either in my three years at Post. 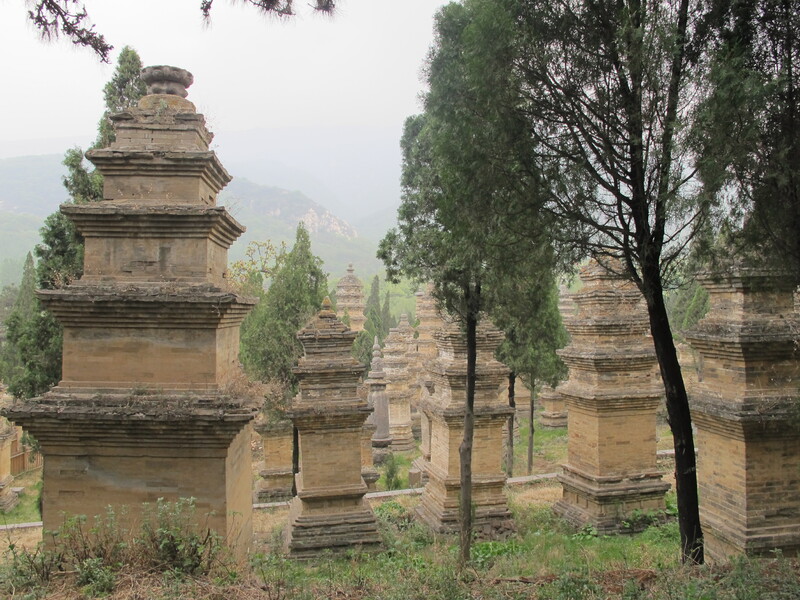 My first day trip was to the Tombs which are located northeast of Beijing in Zunhua, Hebei Province about a two hour drive from Beijing (using trusty driver ‘Mr Mike’). 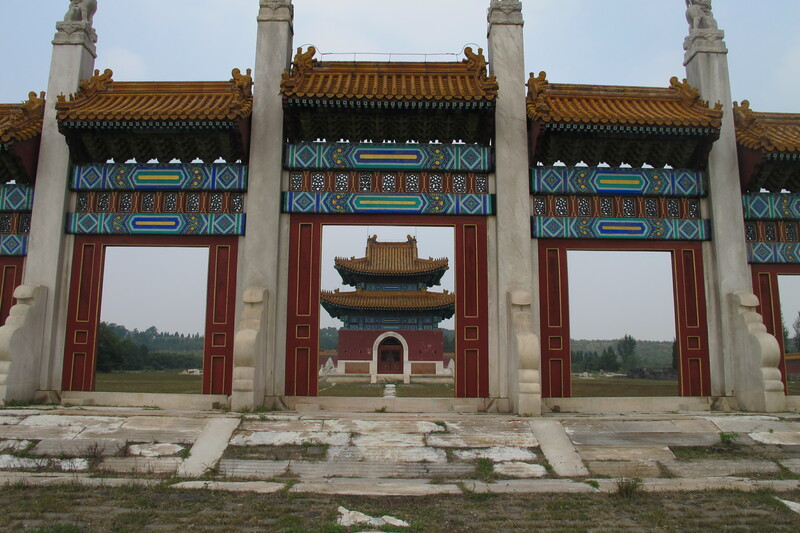 The Tombs are surrounded by four mountain ranges and five emperors, fifteen empresses, over a 100 imperial concubines and various princes and princesses are buried within the eighty square kilometre site. 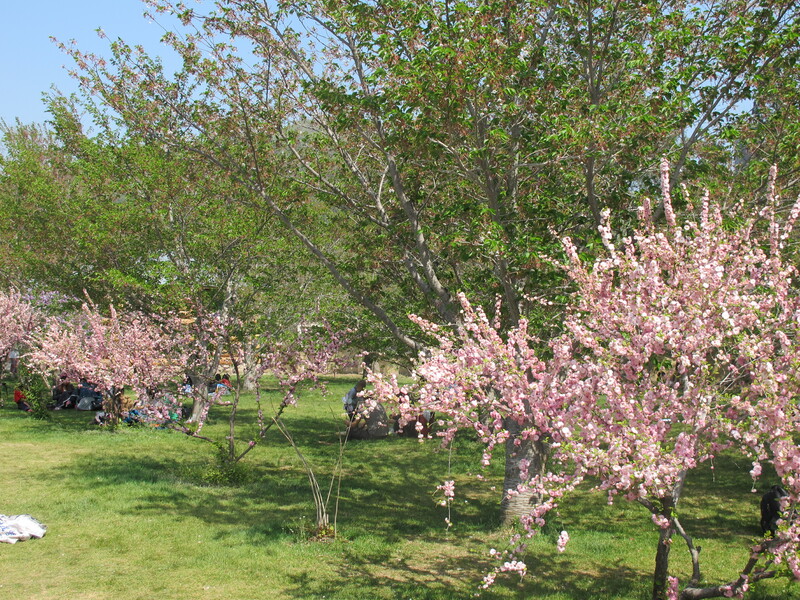 If you are thinking of visiting a nice idea is to take a picnic as there is limited food etc on the grounds and there is enough shade and places to sit for an hour or so to relax in-between tomb visiting. 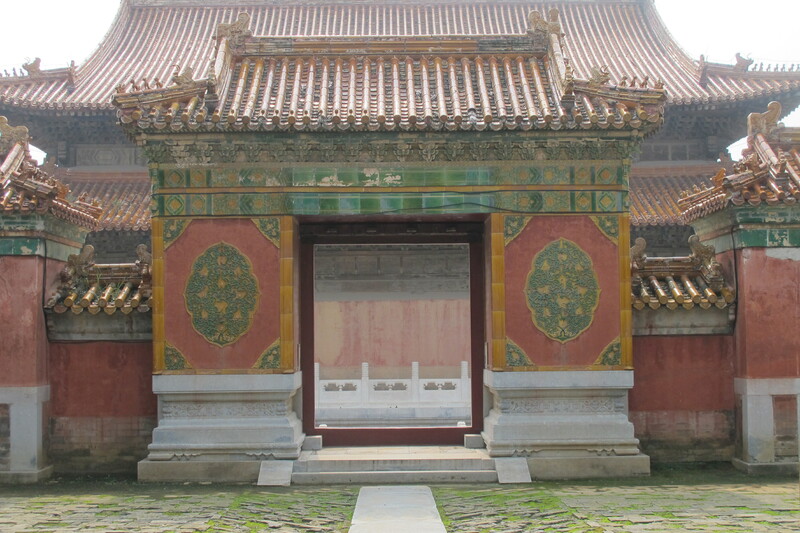 The cost of entry is about 152 RMB but this affords you the opportunity to visit all tombs – too many for one day though so perhaps still a bit pricey. 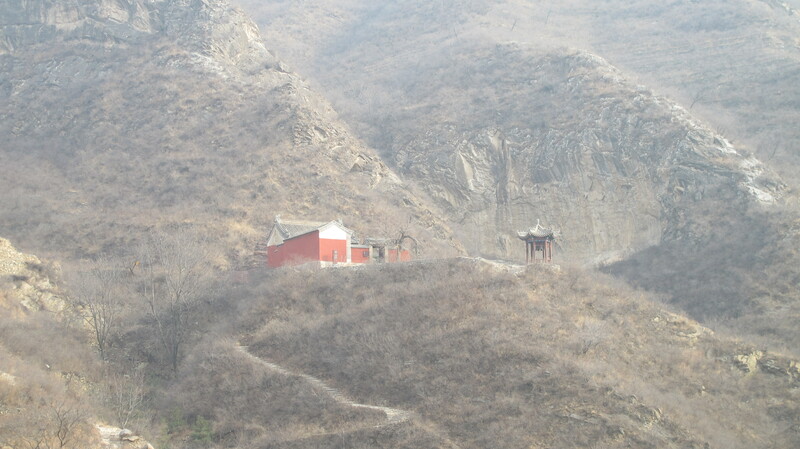 I visited two tombs; the Yu Tomb (belonging to Xian Long who was the 6th Emperor of the Manchu led Qing Dynasty – a ‘good lookin’ rooster’ as we say in Australia) and the DingDong Tomb belonging to the Empress Dowager Cixi, a powerful woman who was said to be the power behind the throne for forty-seven years during the Manchu Qing Dynasty. A long day but very enjoyable. 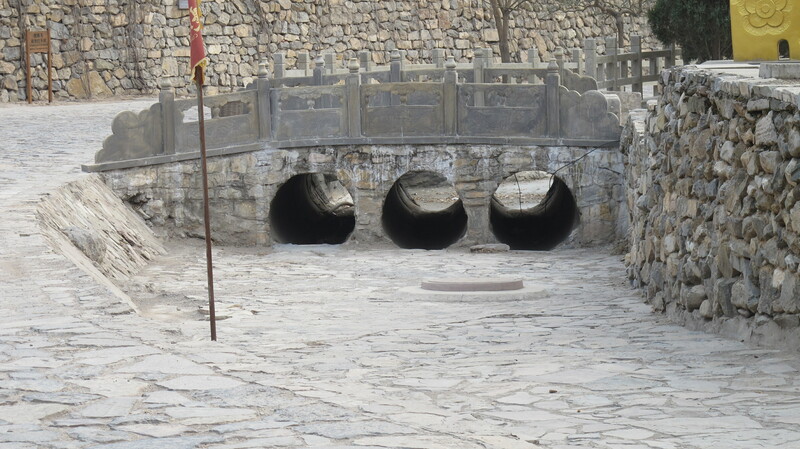 A friend also told me of a single standing tomb about a five minute drive away from the Qing Tombs. So on the way home, Mr Mike found its location and with no entry fee and no people it was great to see. 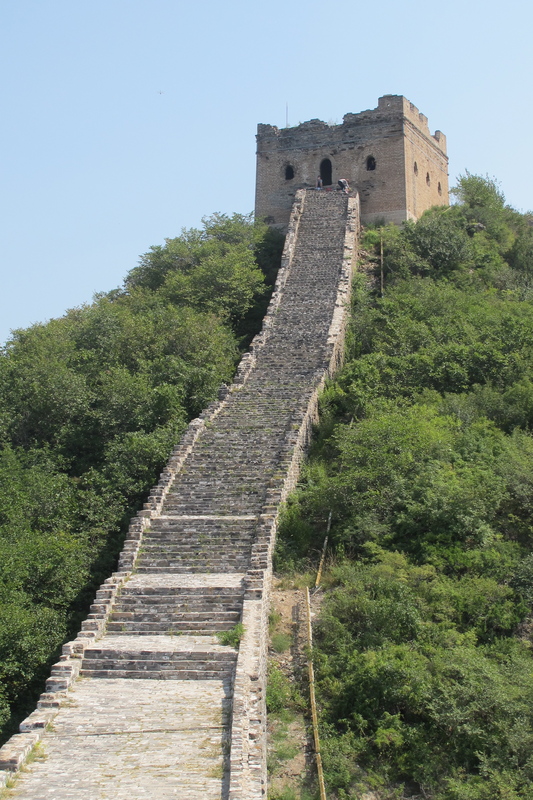 One other day trip I definitely wanted to do was to re-visit the Wall. 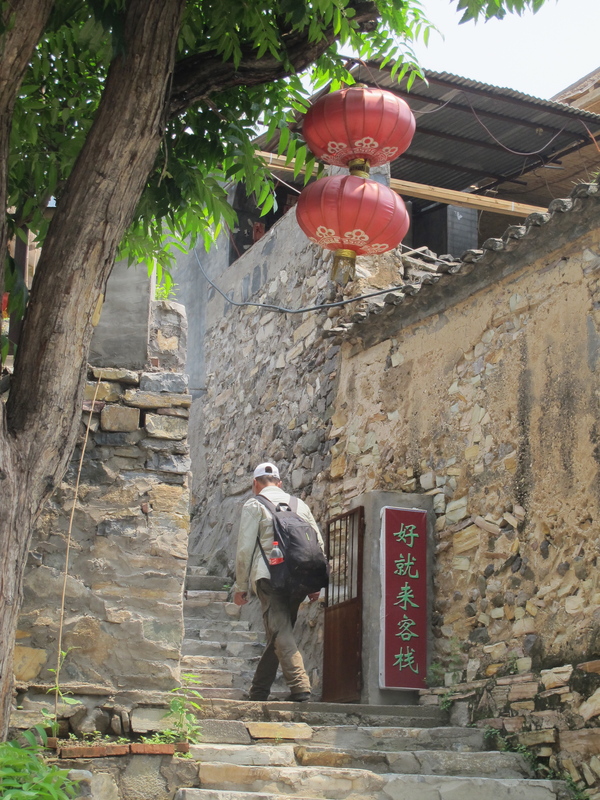 I didn’t really mind which section but Mr Mike told me about Simatai located in Miyun County, which had been closed since 2010 but recently re-opened. So again hired a driver and with two friends set out. 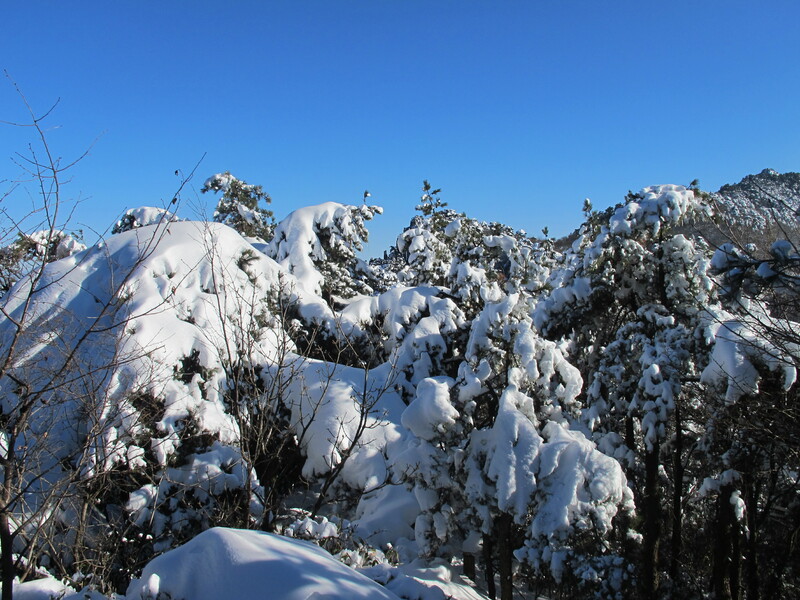 We left early so it was a good drive without traffic as we were travelling about 120 kms northeast of Beijing. 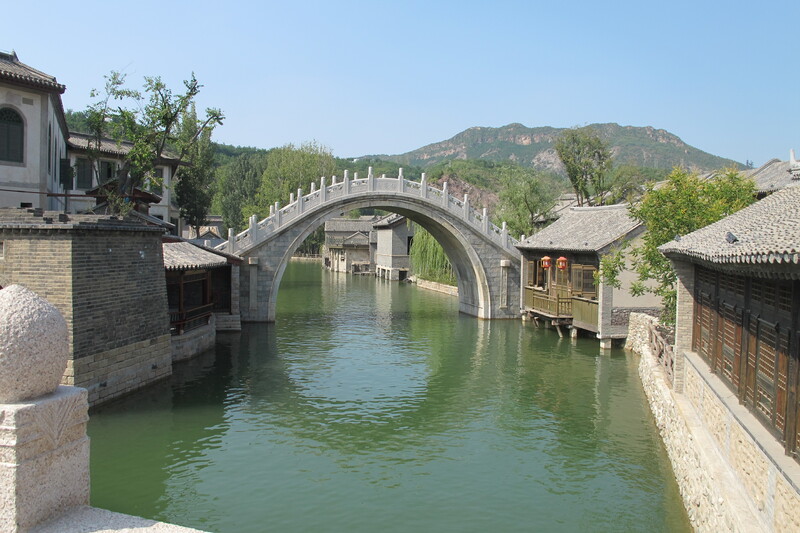 An entry ticket was about 110 RMB which really was to access a new water town (Wtown and also known as Gubei Water Town). This ticket does not give you access to the cable car to the Wall. On the internet later, we found out you can visit the Wall and not pay for the Water Town as long as you book on-line and arrive at the allocated area to depart for a Wall tour at either 10am or 2pm, otherwise you have to pay the 110 RMB for access through the water town. 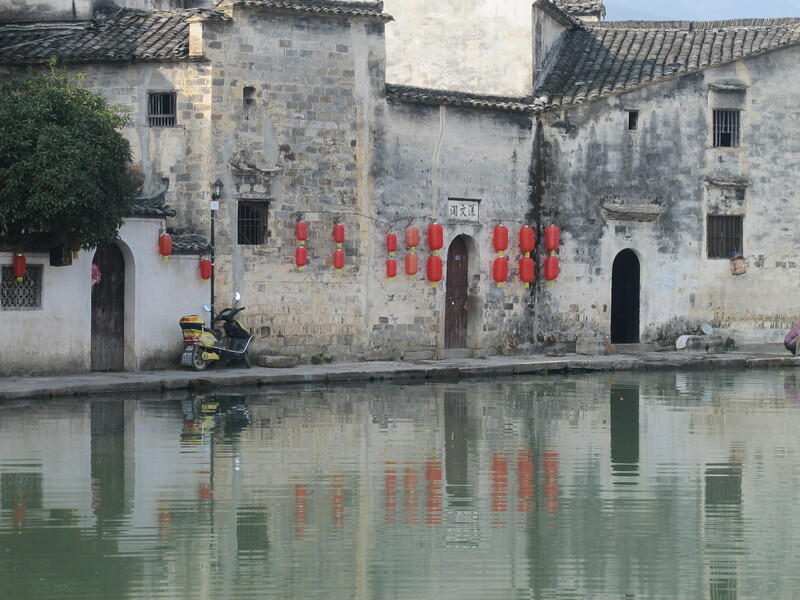 However, I am really glad we did not know about this as I really enjoyed strolling through the water town. 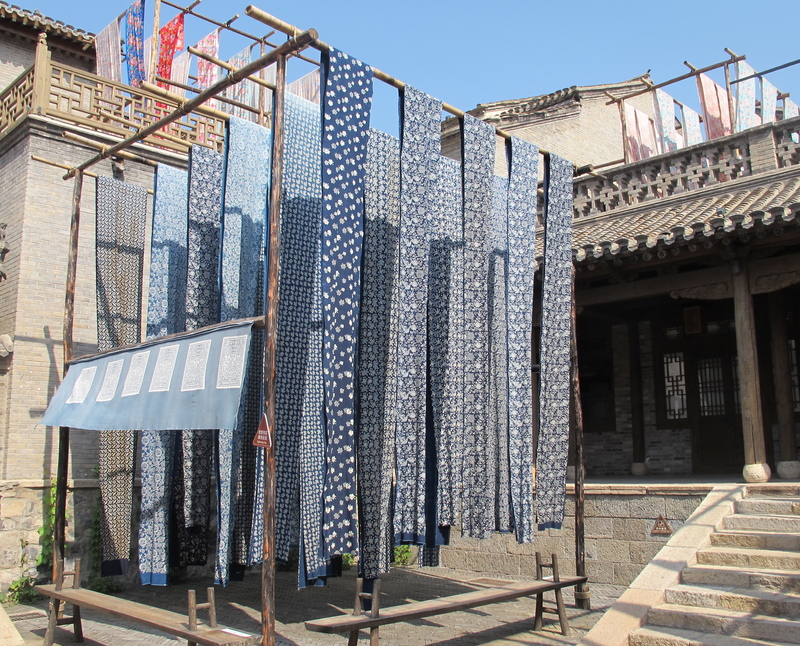 We got lost in the water town which was fortunate as we came across a lovely little courtyard with a display of dyed cloth blowing in the wind. Inside was a small factory with demonstrations on how cloth is dyed – really interesting. 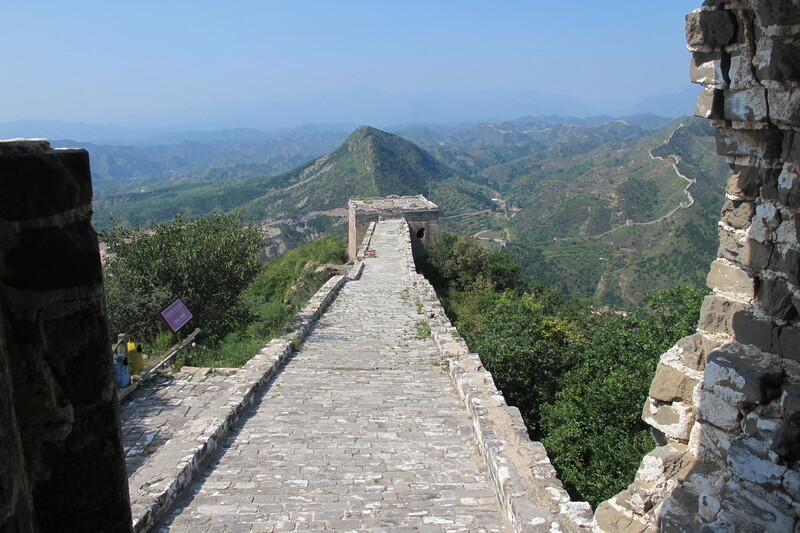 After walking about an hour through Wtown, we took a cable car to the top of the Wall (not really the top as there are still are about 150 steep steps to climb…grr)and then walked on the Wall – Simatai is incredible, very untouched with spectacular views. 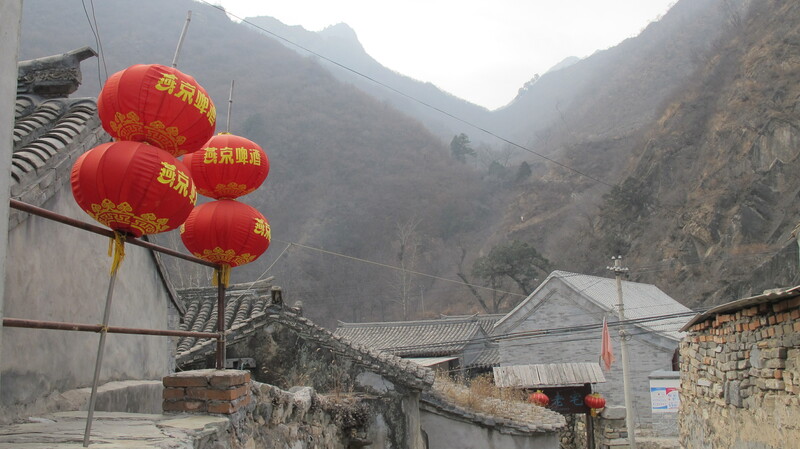 My friend only told me when we arrived that Simatai is known for its steepness (grr again) Unlike Mutianyu, there are no side walls so for me it was confronting – my friends walked from turret number 8 to number 5 on the Wall and then walked along a different path below the Wall to return to me at the cable car. 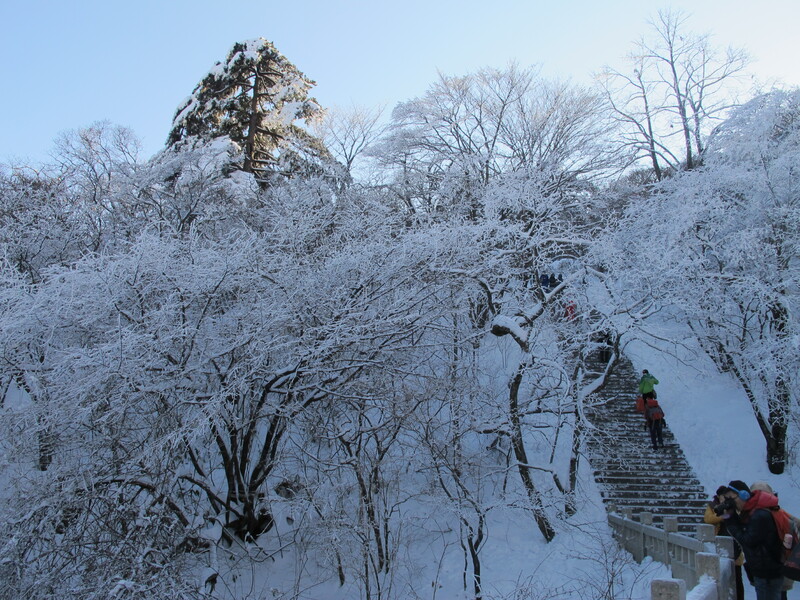 Very few people were on the Wall and one fellow had just walked up (about an hour and half) and said the climb was very steep and steps not in great shape. 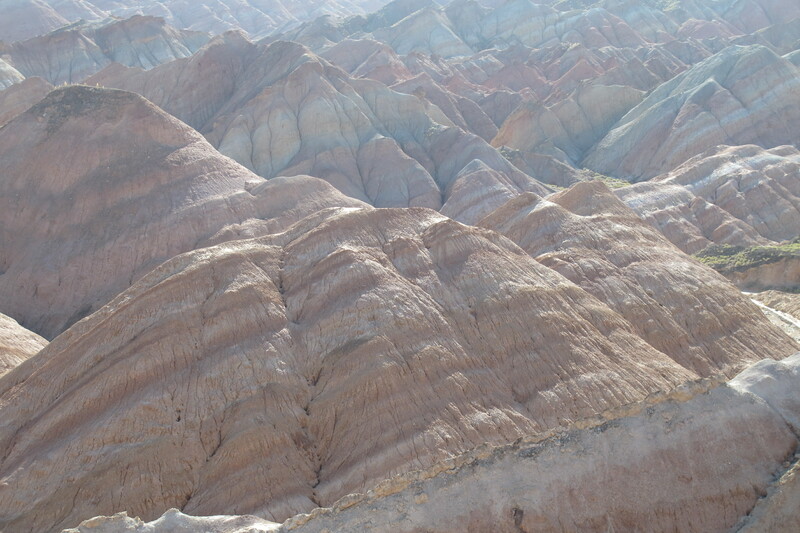 He said it would be a little difficult to walk down due to that steepness. We intended to walk down but after this advice decided it was not a good idea (I was very happy with this outcome). If you don’t buy a return ticket on the cable car (120 RMB) it will cost you 80 RMB each way (and we did try and get a discount even though we didn’t buy the return ticket, but no luck). We had lunch at a little restaurant at Wtown overlooking the water where the menu was completely in Chinese but between us we ordered a sensational eggplant dish and cabbage dish; with rice for three people at a total cost of 76 RMB!! I love China!! We were also very lucky with the weather, blue skies and a sunny day which made for a fabulous day out. 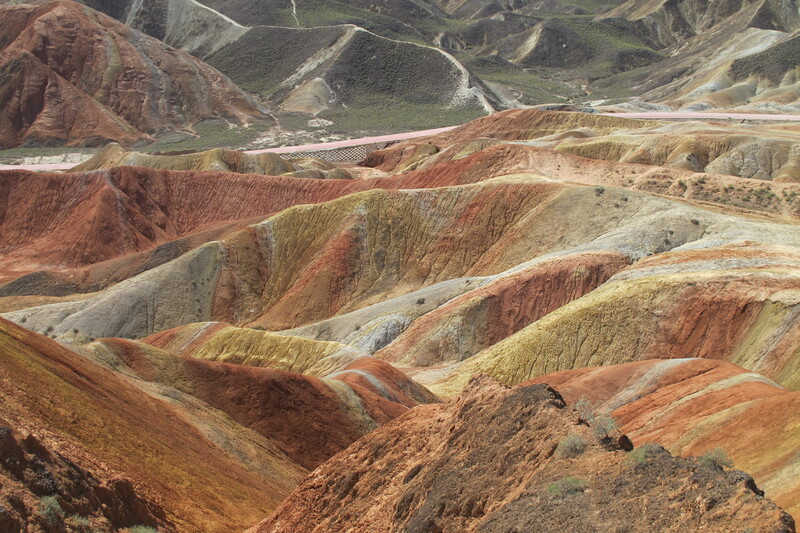 My only lengthy trip during my visit to China in September was three days in Gansu Province to see the Rainbow Mountains. 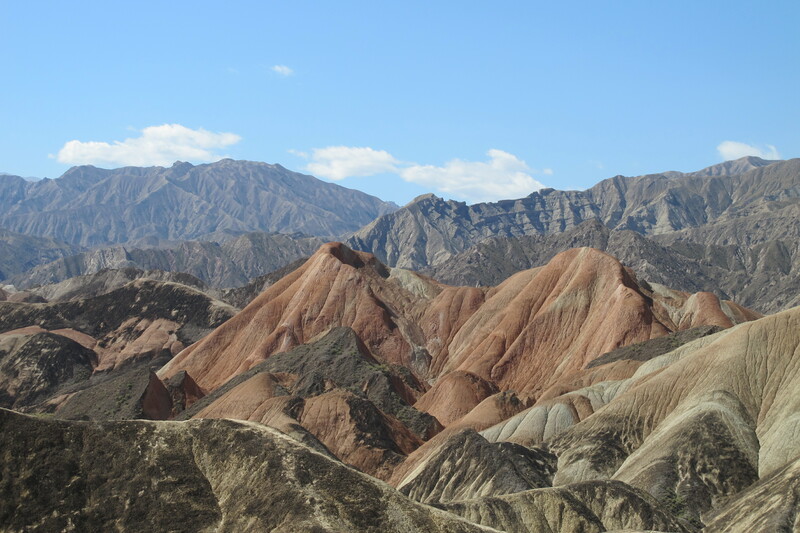 Whilst working at the Embassy I did travel to Gansu to see many sights but did not manage to see the Rainbow Mountains which are located in Linze. 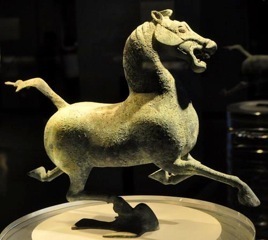 I flew from Beijing to Lanzhou and was picked up as I really wanted to visit the Gansu Provincial Museum in Lanzhou (70 kms from the airport) to see ‘Ma Ta Fei Yan’ 马踏飞燕 [Bronze Galloping Horse treading on a flying swallow]. 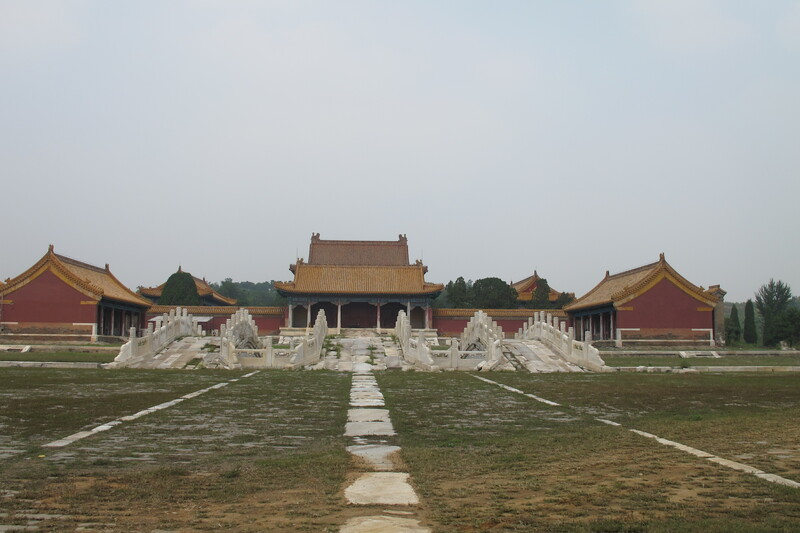 Ma Ta Fei Yan was originally buried at the Leitai Tomb of the Eastern Han Dynasty. 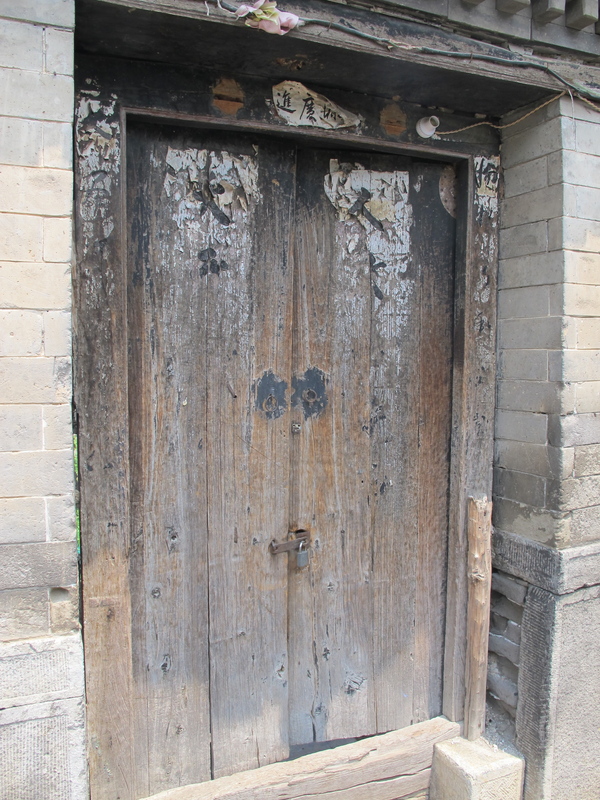 The actual tomb where Ma Ta Fei Yan was buried is located in Wuwei County about a four hour drive from Lanzhou. This tomb was found by local farmers in 1969 beneath a tree. 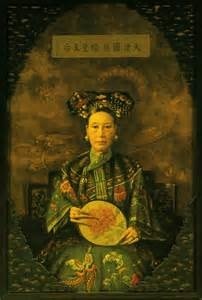 Ma Ta Fei Yan which was taken to the Lanzhou Museum for display along with many other interesting artefacts. 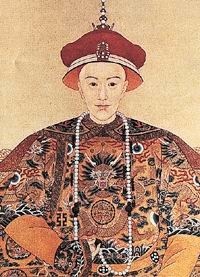 Wuwei County leapt to fame with the discovery of this national treasure. 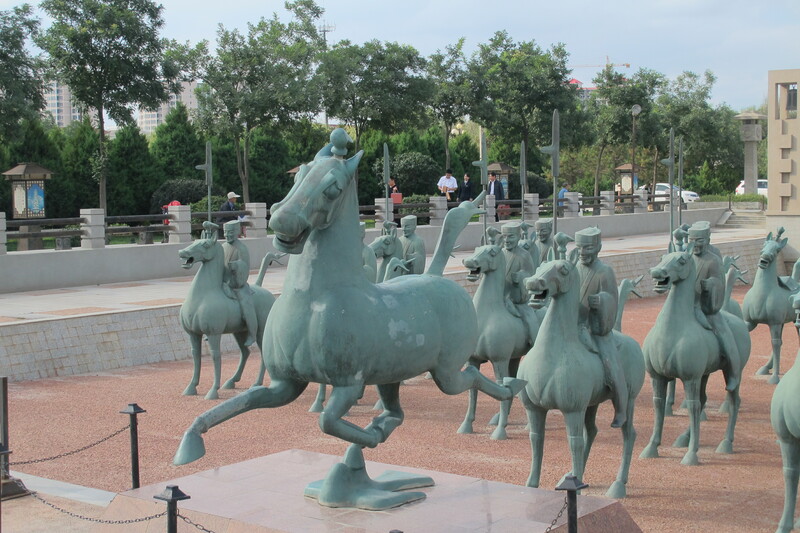 My tour guide [who has extensive knowledge of Ma Ta Fei Yan as it was his main subject in his tour guide exam] told me that the bronze represents sculptures of the Han Dynasty. 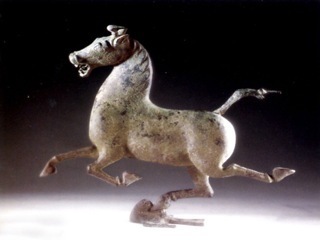 The horse is relatively small and measures about 34 cm high and 41 cm long and the posture is unique and carefully balanced according to dynamics. 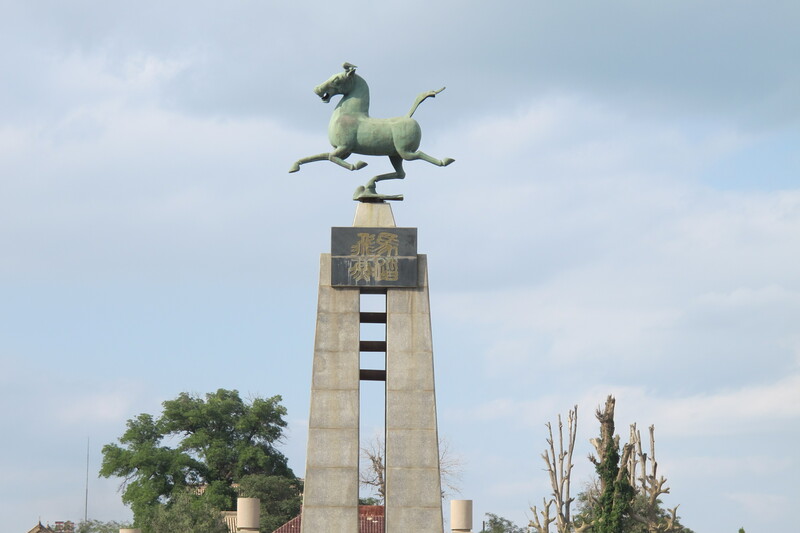 It was created about 2,000 years ago and the positioning of its four legs strictly conforms to that of a living horse which is highly praised by many local and foreign archeologists and artists. The horse is raising its head, neighing and galloping forward with one foot is treading on a flying swallow and that the swift flying swallow sets off the amazingly fast speed of the galloping horse! 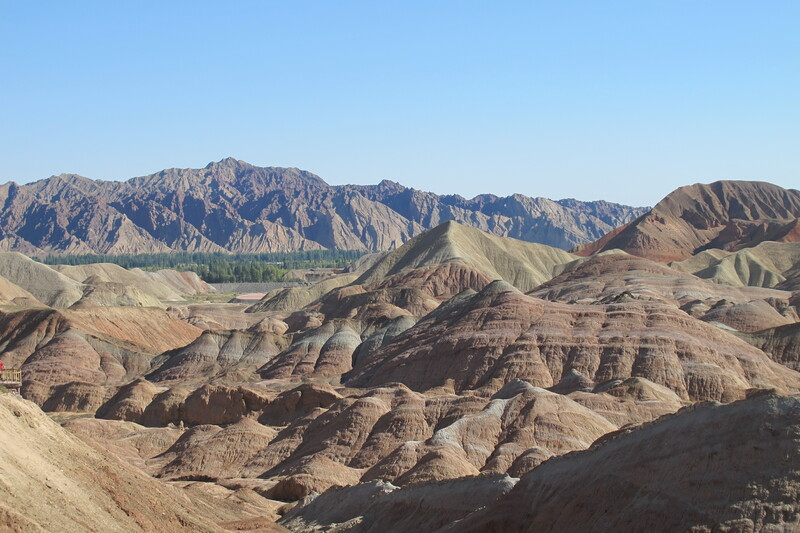 There are several ways to get to the Rainbow Mountains in Linze County – a flight from Lanzhou to Zhangye (closest airport to Linze) is about an hour and a drive is around seven.I wanted to drive so that I could stop off at the site of the Leitai Tomb which is on the way to Zhangye. 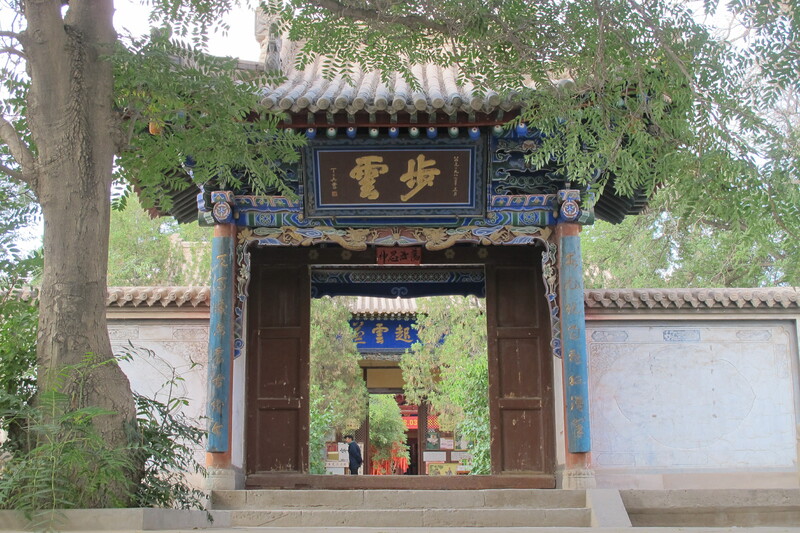 Seven hours is a long drive and I don’t think I would do it again, especially as I had done a long drive in Gansu previously, but we did stop off for lunch and to visit the Wuwei Wan Temple or Confucius Temple. 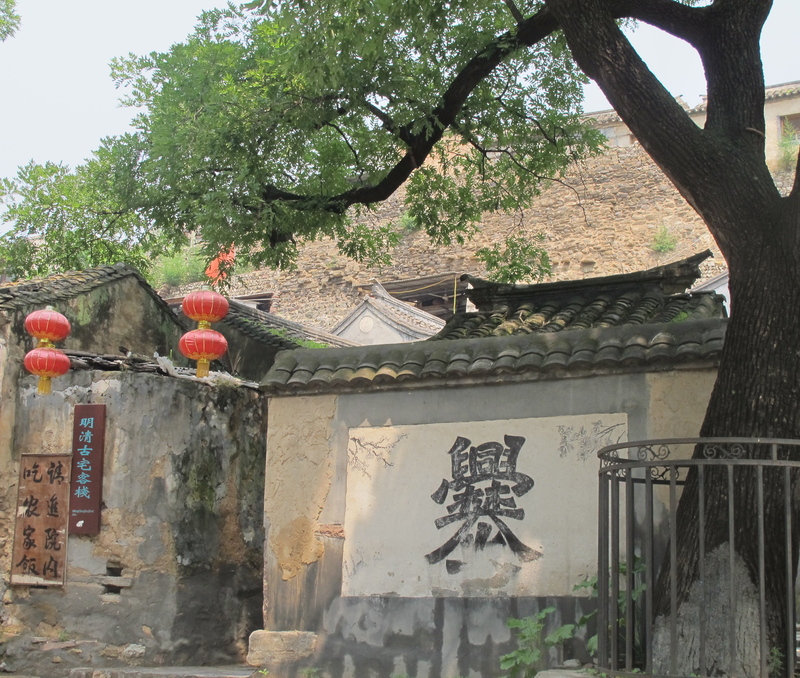 This temple is a sacred place for ancient scholars to worship Confucius. 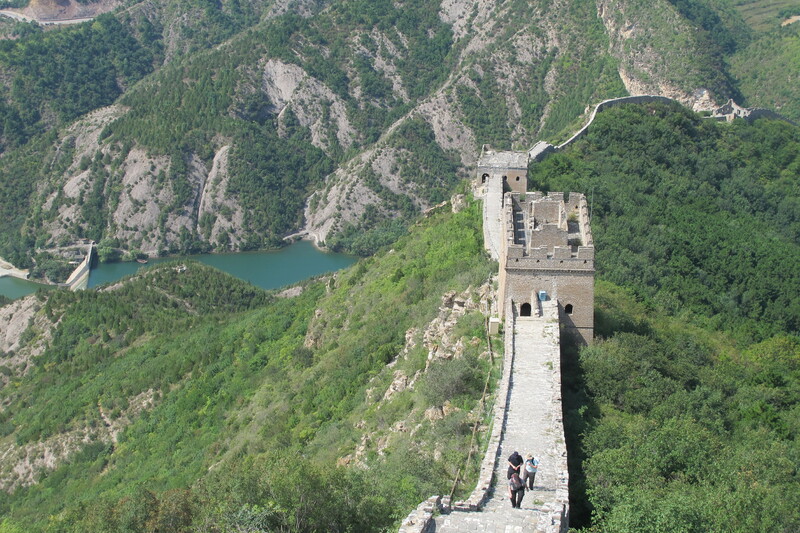 It was first constructed in the 4th year of the Ming Dynasty and has expanded exponentially since then. 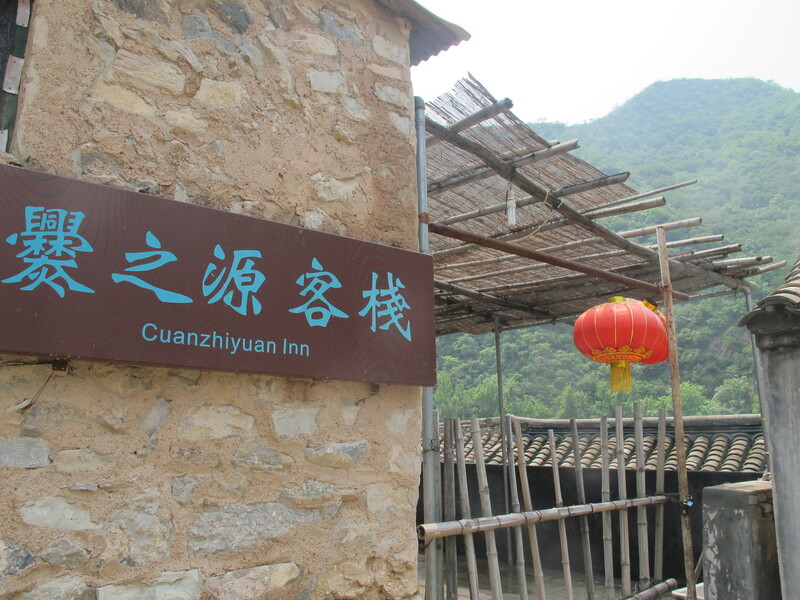 In Zhangye, I stayed at the Qilian Shan Hotel which was clean and comfortable. 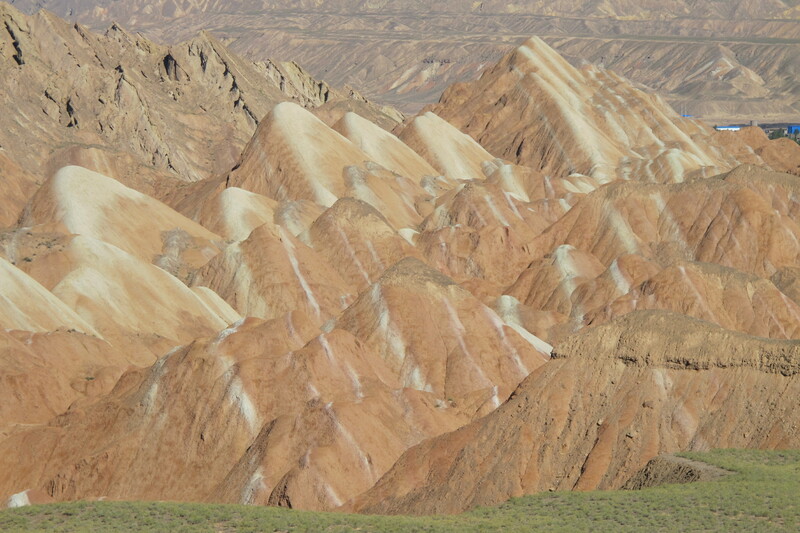 The day after I arrived, I spent several hours visiting the Rainbow Mountains in Linze which is about sixty-five kms from Zhangye so not too far to drive this time. 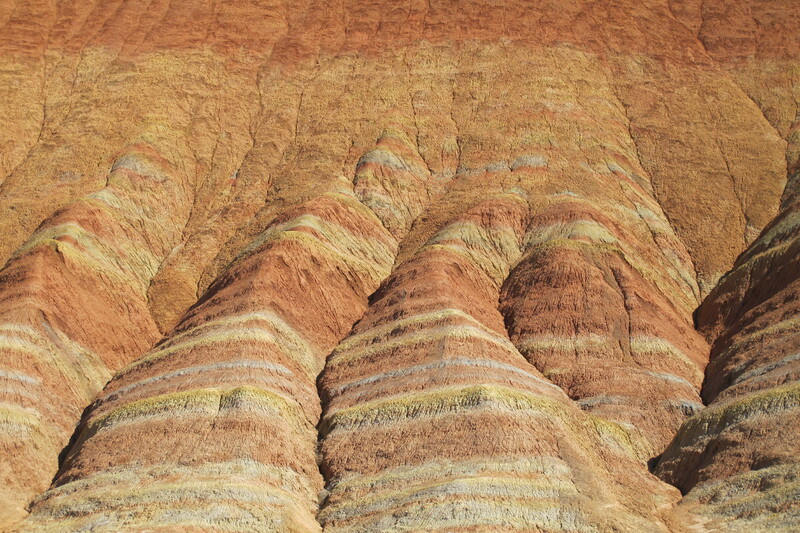 The landforms date back 6million years and were formed by erosion of the red sandstone. Stunning, beautiful and incredible is how I describe them. A must see during any long/medium stay in China! I took this three day trip departing early on a Friday morning. 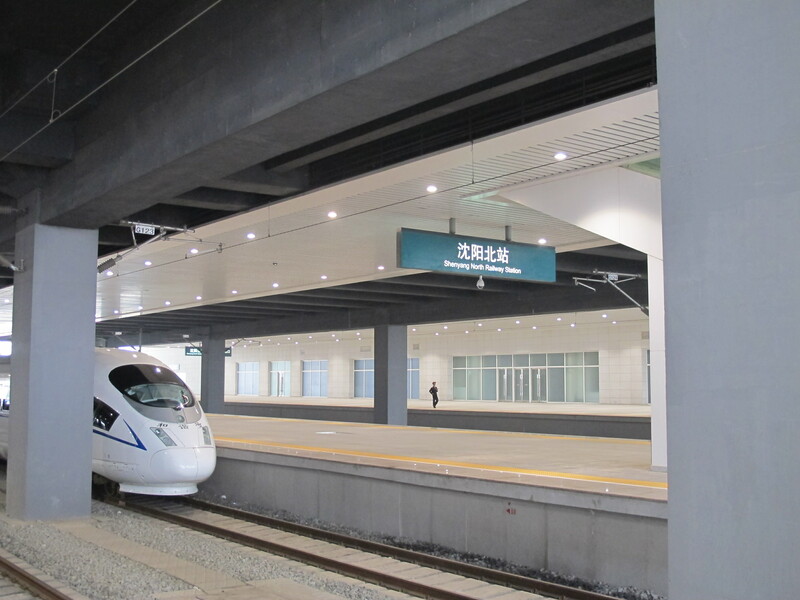 The flight takes around three hours from Beijing with a short stop in the capital, Hefei before arriving in Tunxi. I didn’t have to leave the plane in Hefei [but did on the return leg]. 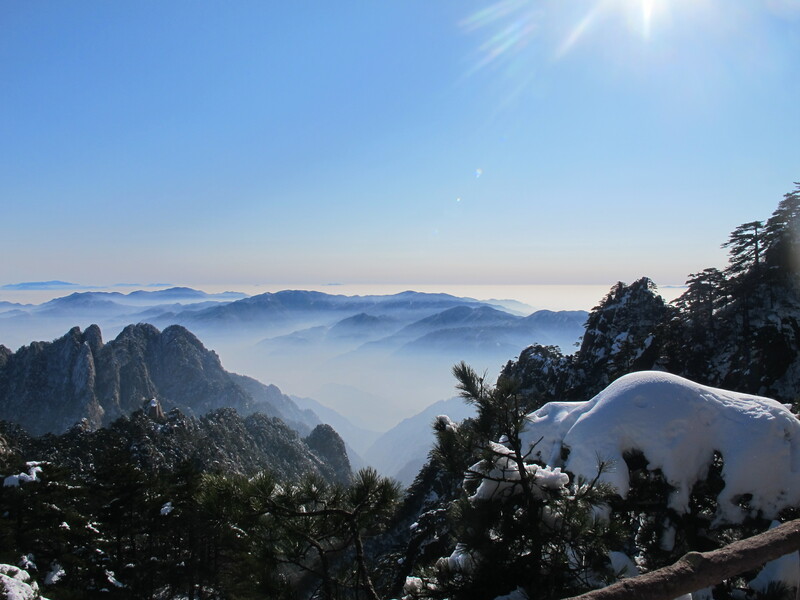 Unfortunately my plane was delayed three hours in Beijing so I did not reach Huangshan until around 5pm. 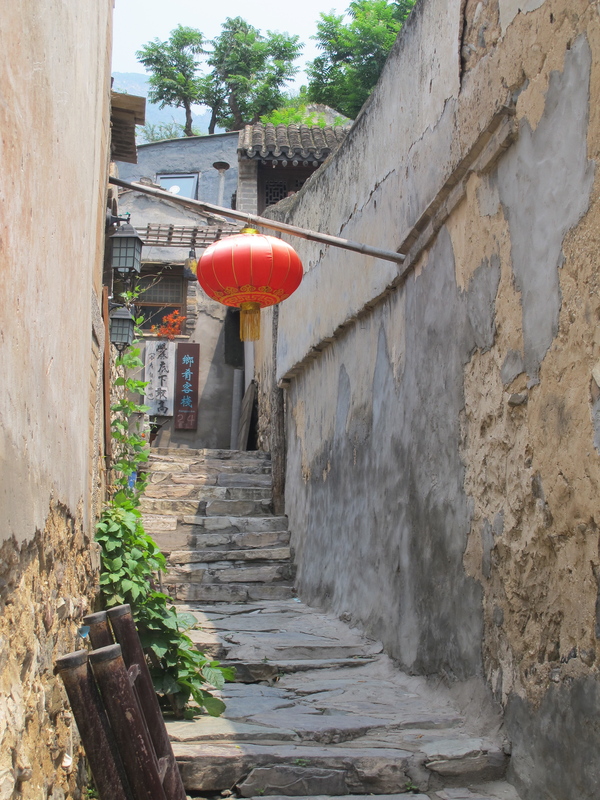 But still time to take a stroll through Huangshan Old Quarter with its quaint and old shopfronts and cobblestone streets. 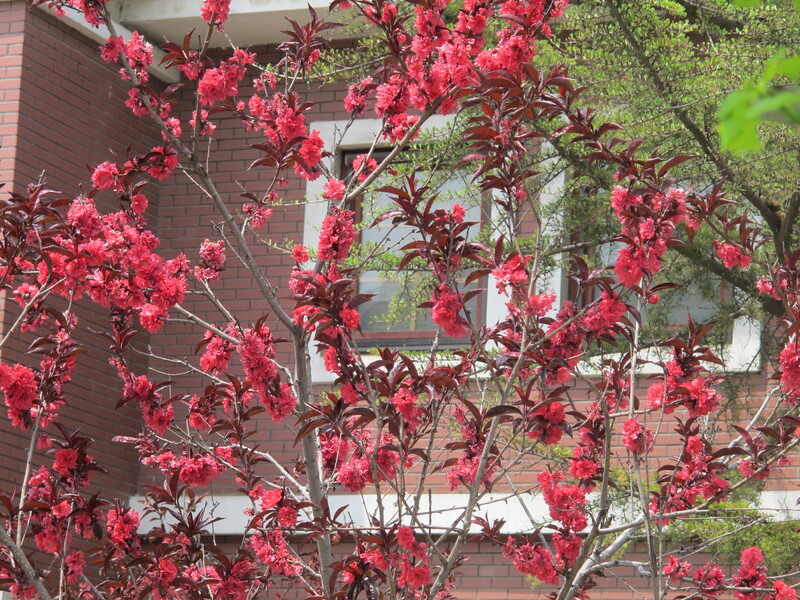 I stayed the Huangshan International Hotel which was clean and comfortable with WiFi in the rooms. 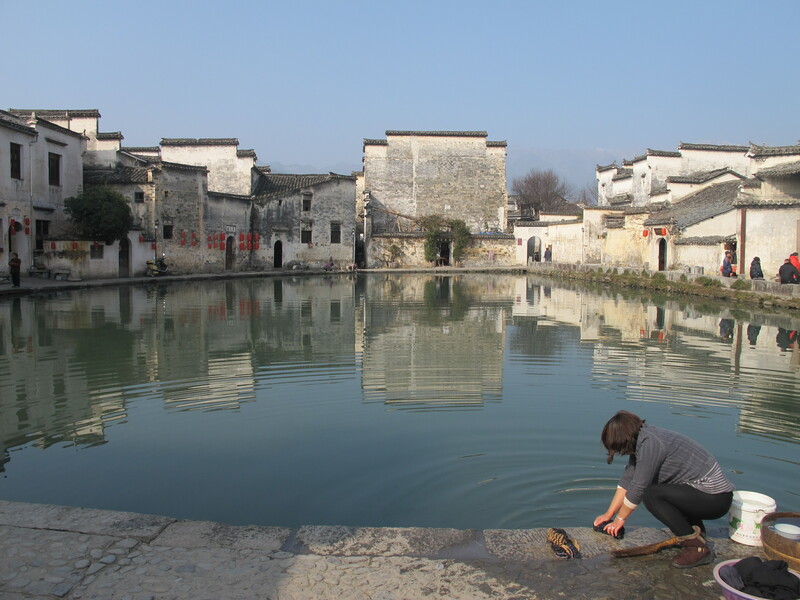 The next day my tour guide (booked through Global Easy Tours)took me to Hongcun Village which coincidentally is the same village used in historical fiction books I was reading (‘Shanghai Girls’ and its sequel ‘Dreams ofJoy’ author Lisa See). 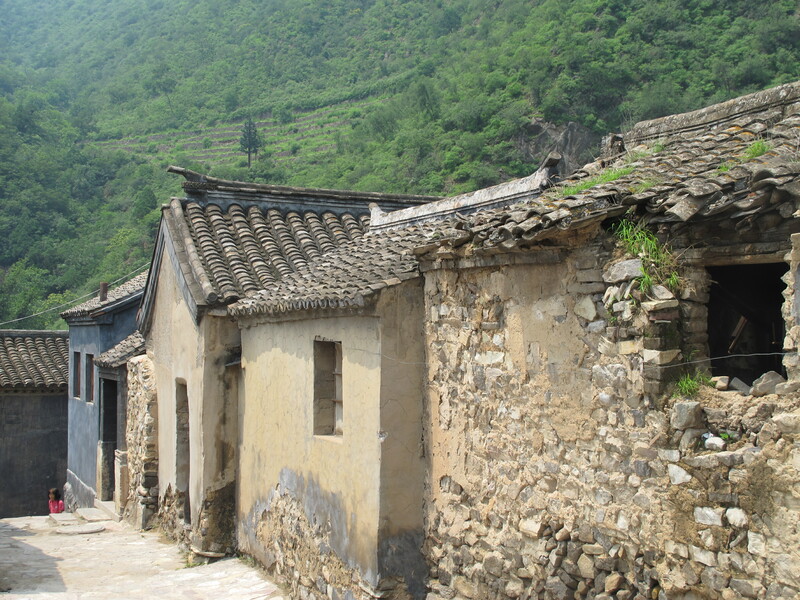 The Village has approximately 150 residences dating back to the Qing and Ming dynasties. 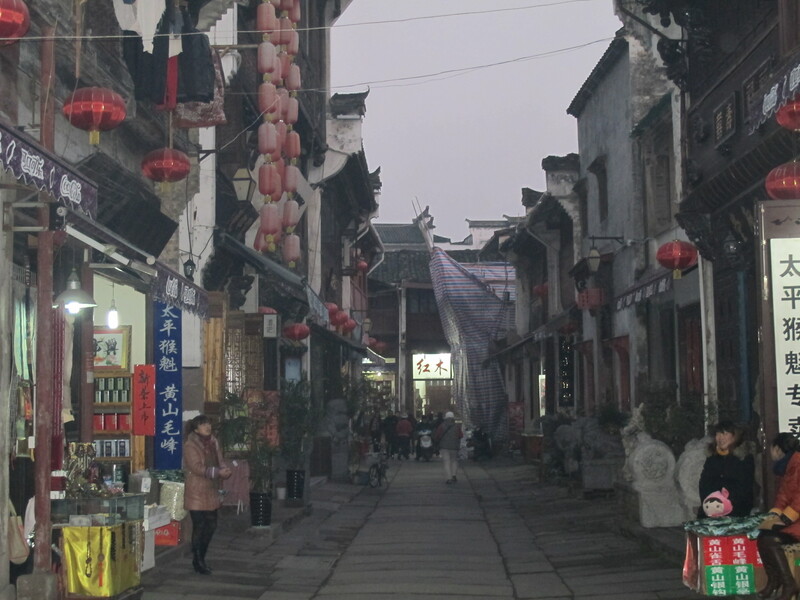 The village was also used for some of the scenes in the movie ‘Crouching Tiger Hidden Dragon’. It really is worthwhile seeing this village. 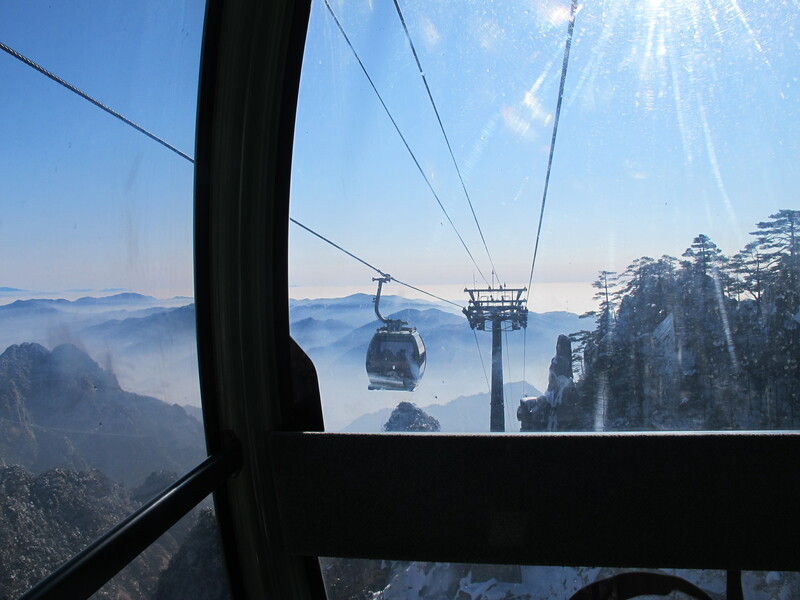 After lunch we travelled to the foot of Yellow Mountain and caught a cable car to the top – about a ten minute ride – with magnificent views. 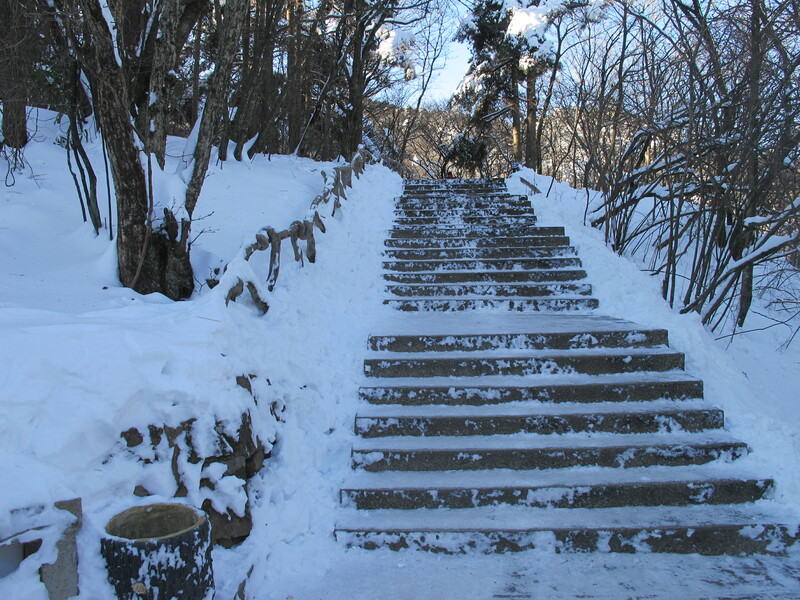 My tour guide had advised me that to get to my hotel (Beihai Hotel on top of the mountain) I would have to walk for some time up and down 1000 steps. So I left my luggage at the International Hotel and just took the essentials in my backpack – I didn’t take my computer and forgot my book so the evening was a touch boring. But the tip saved me lugging everything up and down steps. 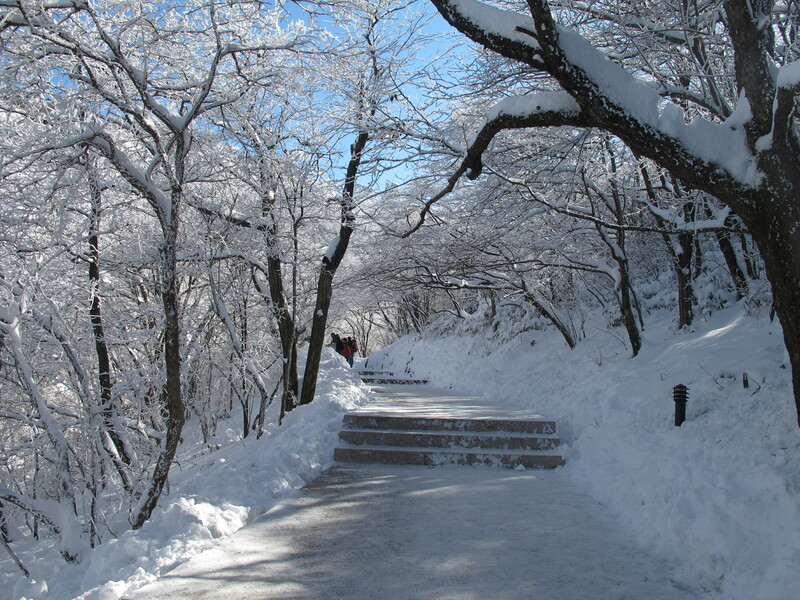 The walk to the hotel is not difficult but might be a bit much for younger children and the elderly. 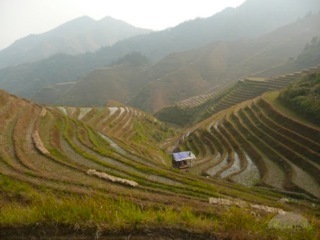 Breathtaking scenery along the way especially at the top and on the way down the following day, I think the views are some of the most spectacular I have seen in China!! The tour guide I used through Global Easy Tours was Mr Kevin WU (wkevin285@gmail.com) – I highly recommend Kevin who speaks perfect English and is extremely knowledgeable and friendly. After three years of writing about my travels in this fabulous country, this is my last travel story. 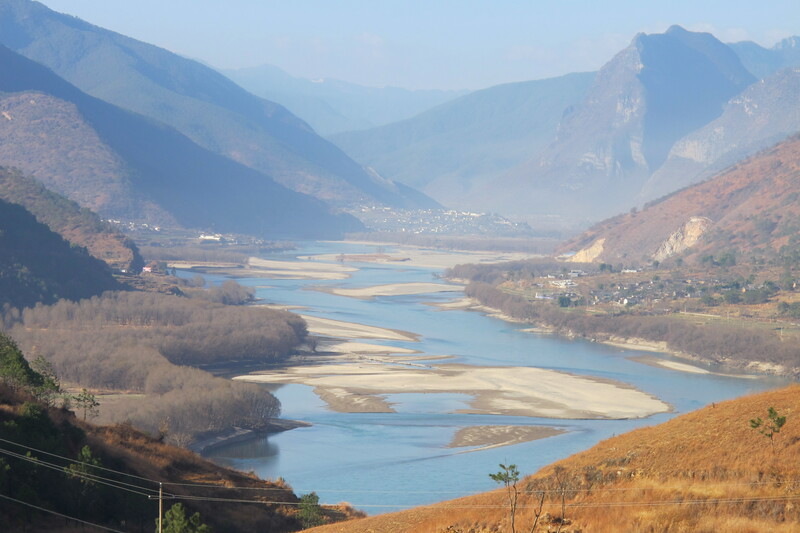 I had been to Yunnan in 2013 for work but did not get to see the fabulous sights so I booked a five day trip in December when I knew it would be rather cool but mainly hoping there would be snow on the mountains. I was in luck, the beautiful Jade Dragon Snow Mountain in Lijiang had part of its peak covered and from my hotel I had a fabulous view. 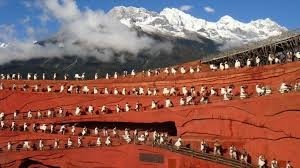 This hotel is very lovely and staff are incredibly professional and friendly (Lijiang Resort and Spa – http://www.pullman-lijiang.com). 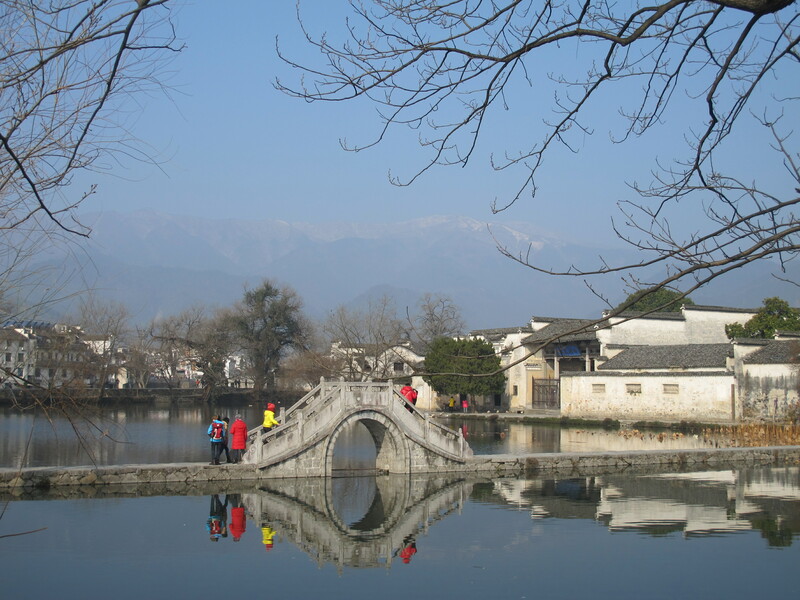 In Lijiang there is a lot to do including seeing the Lijiang Impressions show which demonstrates the traditions and lifestyles of the local Naxi, Yi and Bai ethnic minorities against a backdrop of Snow Mountain. 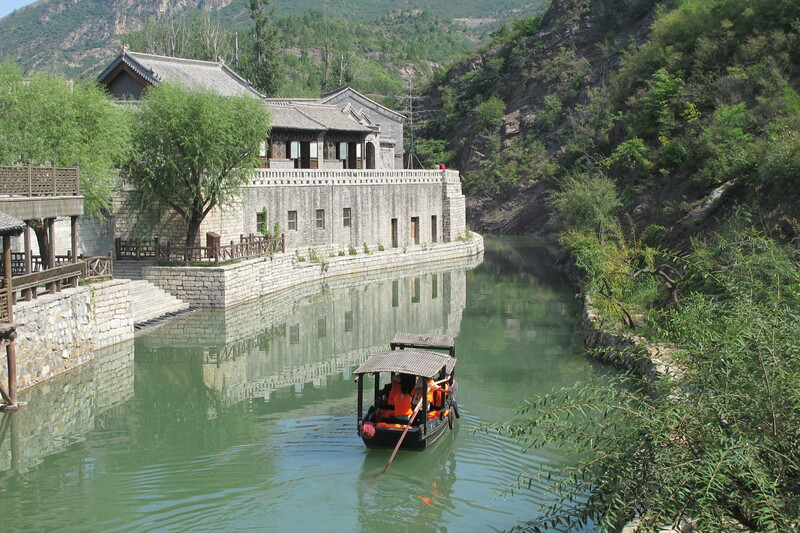 Also worth a visit is the Old Town of Lijiang, Shuhe Ancient Town and/or DaYan Ancient Town. 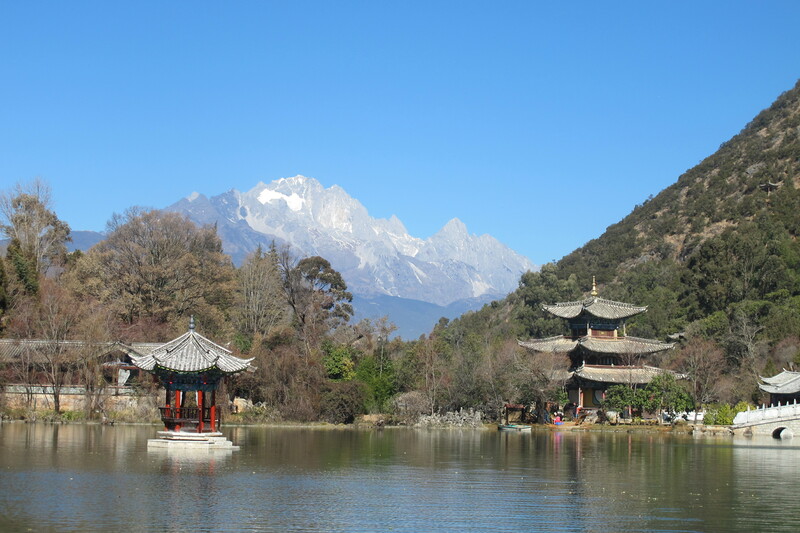 Shuhe is only a ten minute walk from the Lijiang Resort so for convenience I went there. 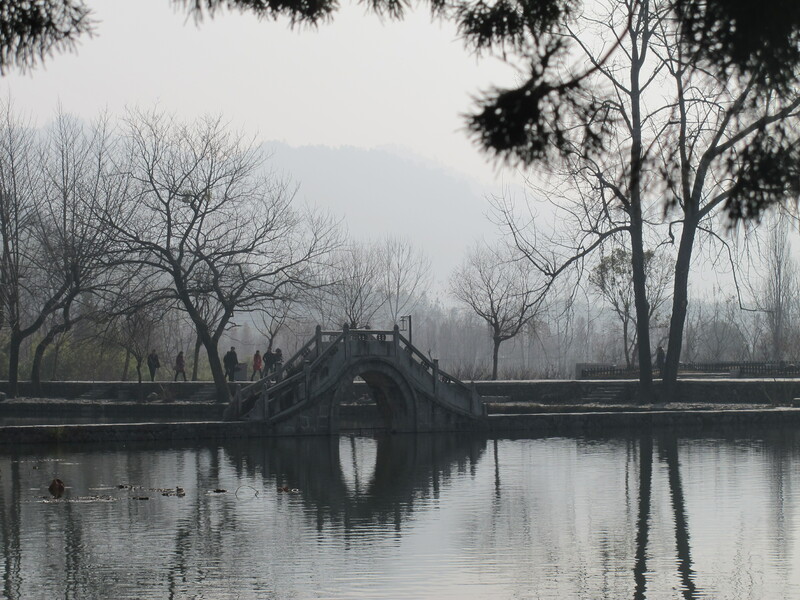 I also walked around Black Dragon Pond Lake [the north gate of the Lake is actually connected to DaYan Ancient Town]. The Lake also has a backdrop of the beautiful Snow Mountain. 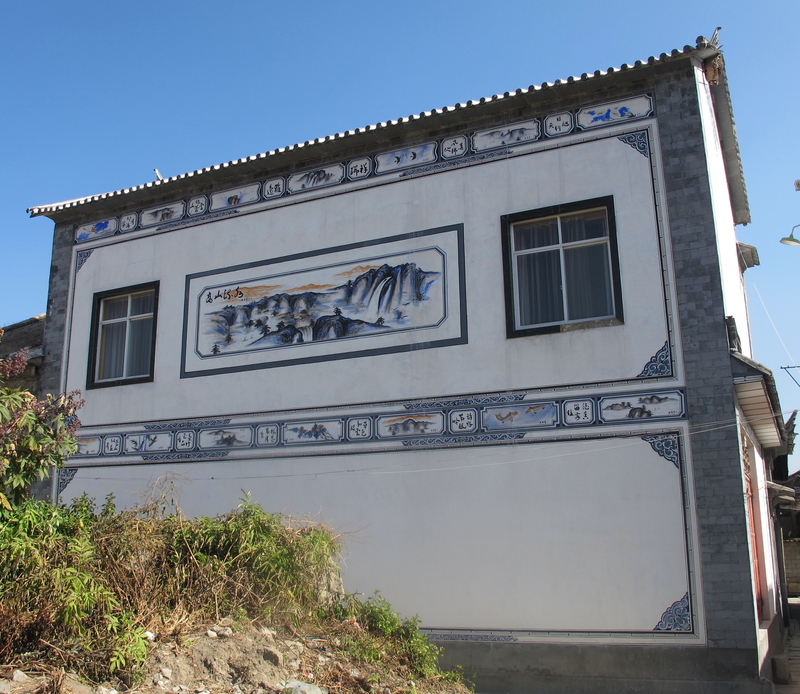 Outside the Lake there is a great little museum of Naxi culture which is definitely worth a visit. My guide told me that the Naxi pictograph script with about 1400 characters is the only pictograph script still in use. She also told the Naxi creation story which is very interesting and involves Father Sky and Mother Earth and nine brothers who cut open the sky with an axe and seven sisters who opened the earth with an axe. A lot more to the very interesting story so a visit to the museum is a must. 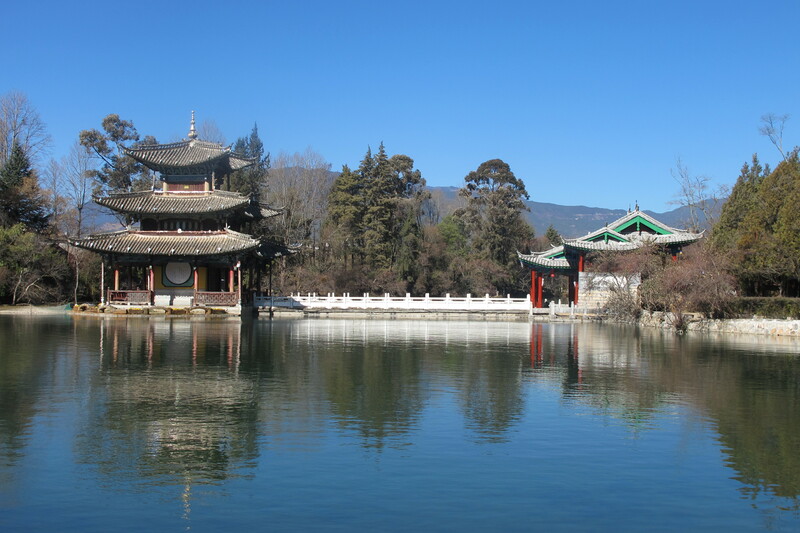 Another lovely place to visit is Lugu Lake but as this is about 200 kms from Lijiang it probably is best to visit on the way to or from Shangri-la; which I did. 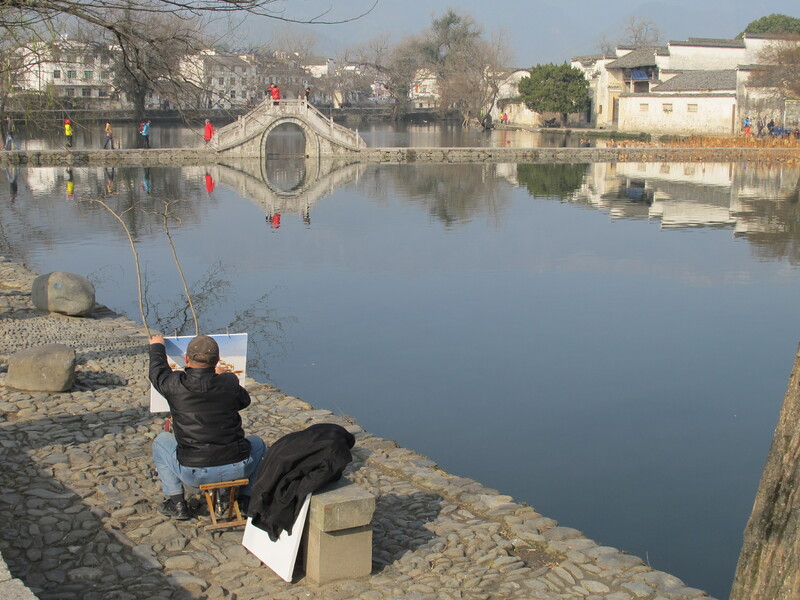 On my second day in Lijiang I took a day trip to Dali which is about a six hour round trip. 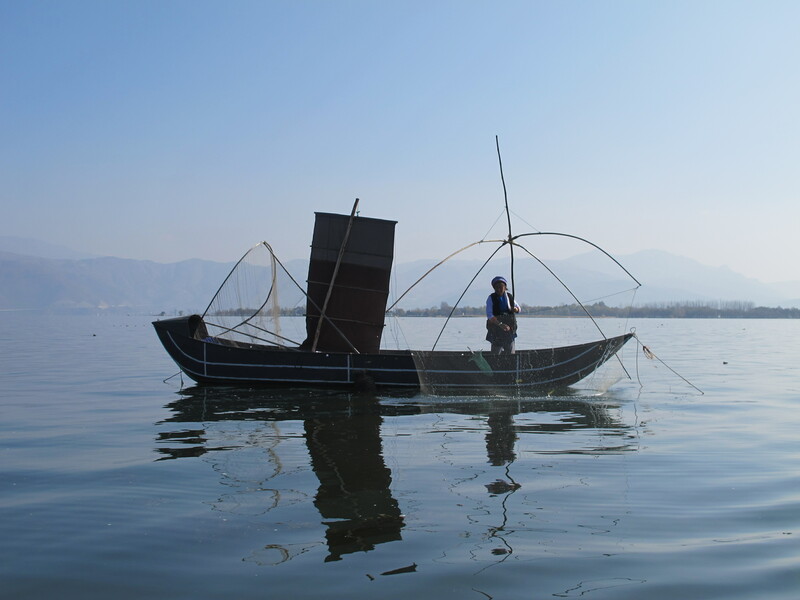 Whilst at Dali I took a rowing boat ride on lake Erhai. 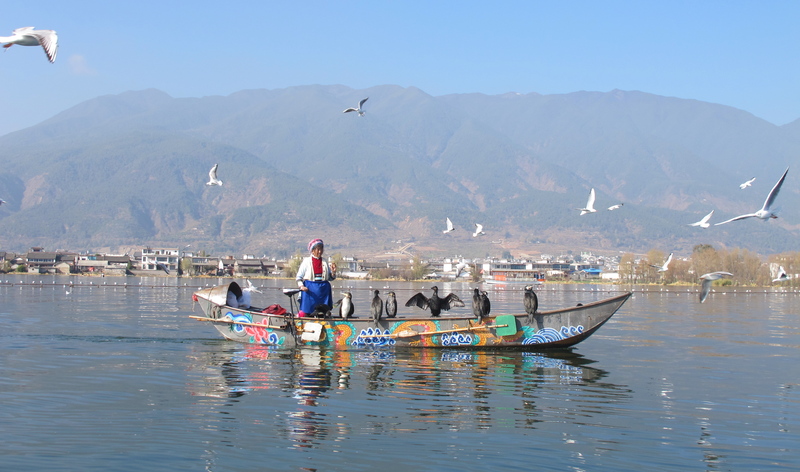 This lake is a very important food source for the locals and many have trained cormorants to carry out the daily fishing…several fishermen also put on a show with their cormorants for the tourists. 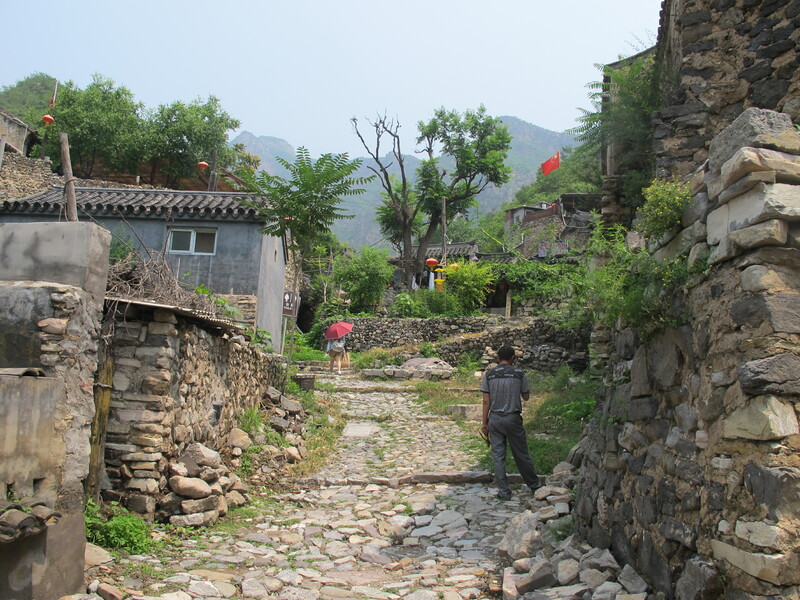 Next stop was to Xizhou Village which lies between Erhai Lake and Mount Cangshan. 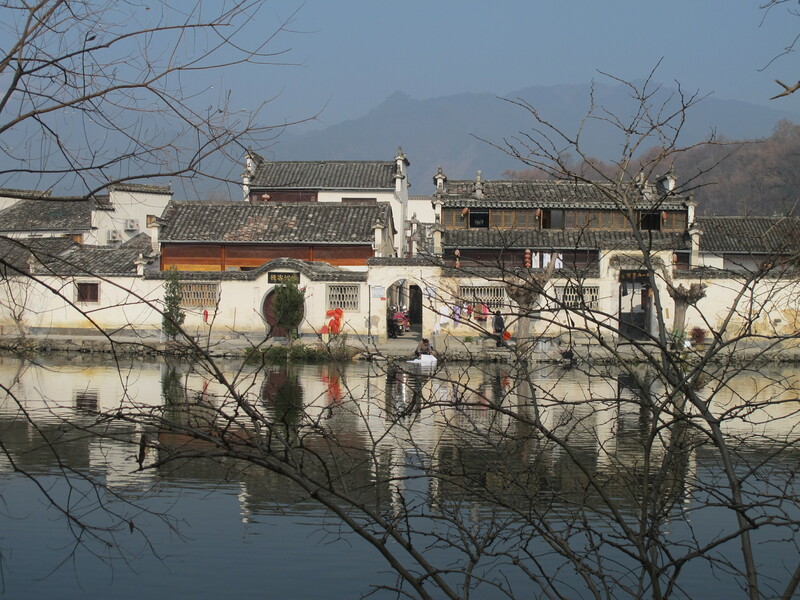 It is occupied by about 2500 residents of the Bai minority. 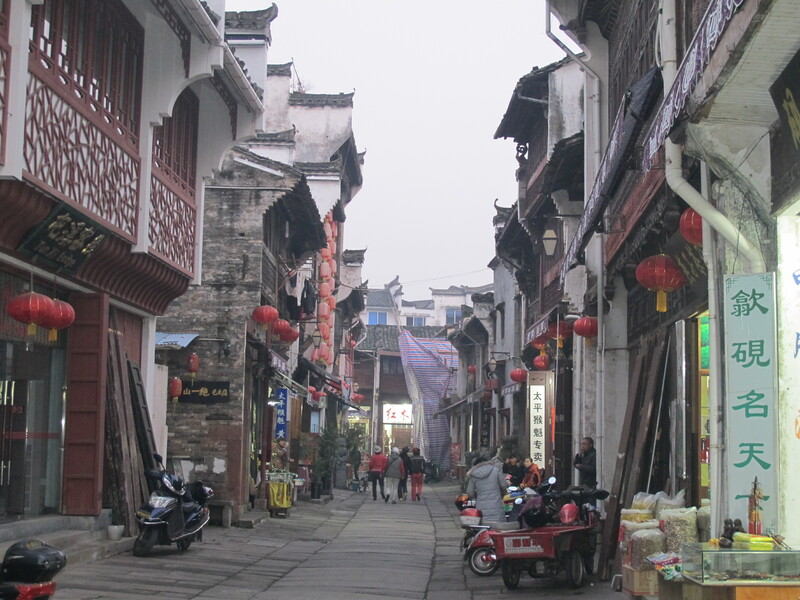 This Village is not overrun by tourists and does not have the usual shops selling Chinese nick knacks – actually there are no shops selling anything apart from delicious local food (Xizhou baba which is a savory or sweet flatbread – delicious)and drinks (local Sandao tea). 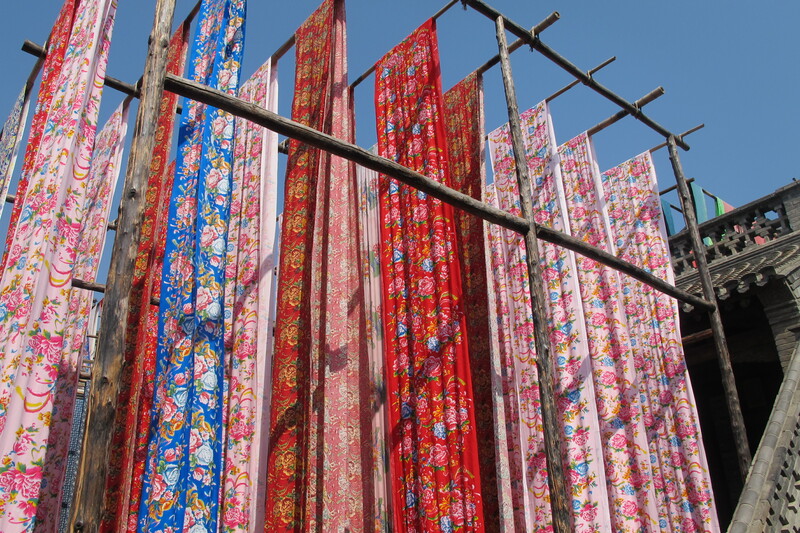 The Bai people have extensively decorated homes, usually painted white with intricate hand painted designs. 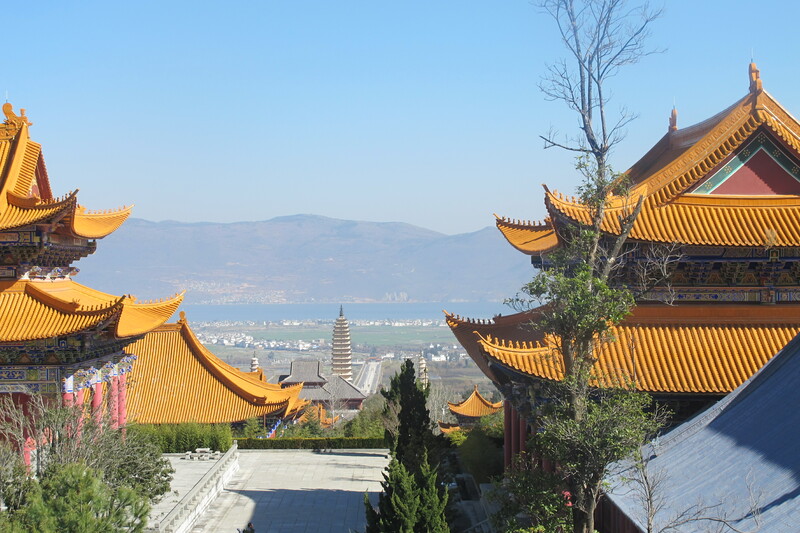 Next stop was to a landmark of Dali city: Chongsheng Temple and the Three Pagodas. 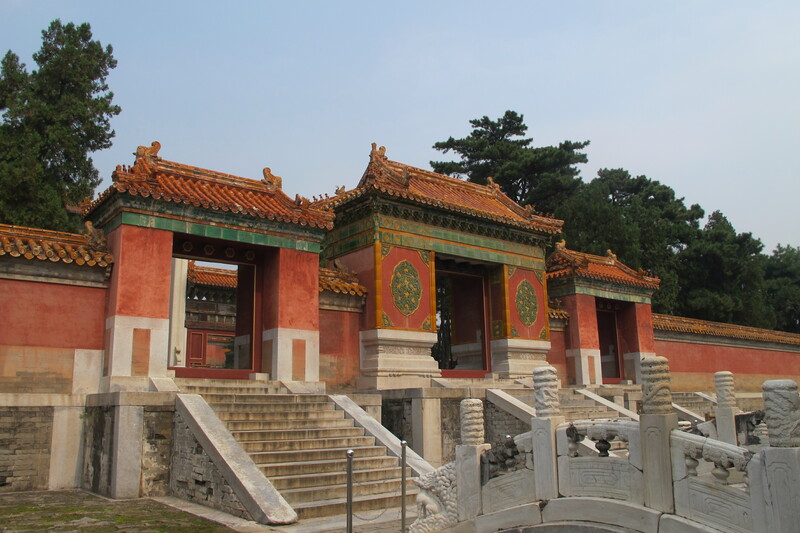 The grounds are enormous and when we arrived at the top of the hill at the main temple (by golf cart) you can see temples, the three pagodas, reflection pools and Lake Erhai. 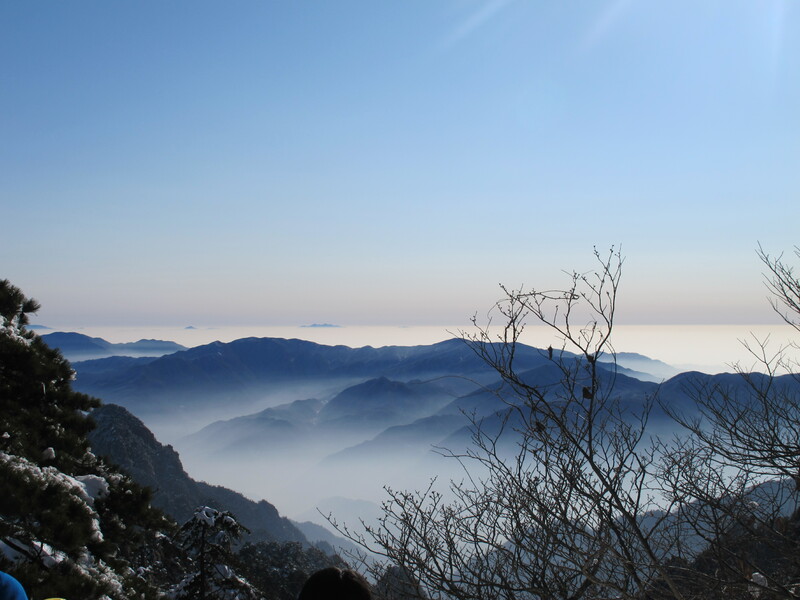 It actually reminded me of being at the top of Jingshan Park in Beijing overlooking the Forbidden City [of course on a good pollution day]. 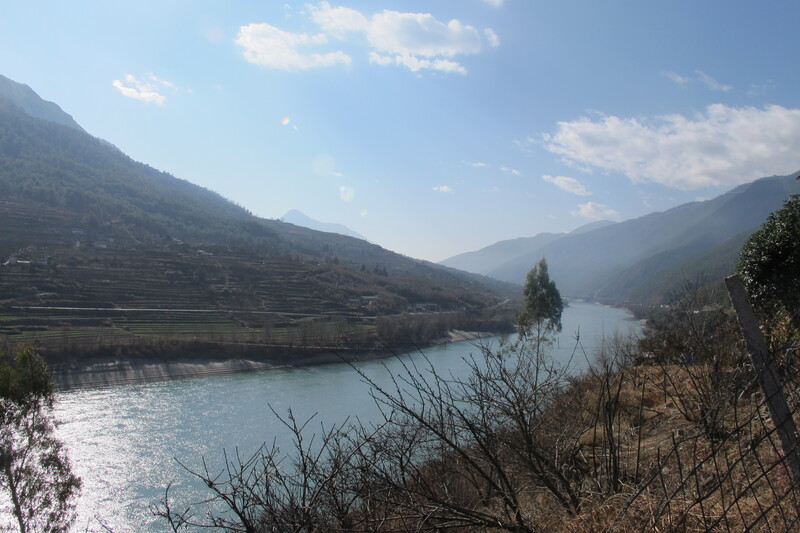 I then took a two day trip to Shangri-la; again by car from Lijiang. 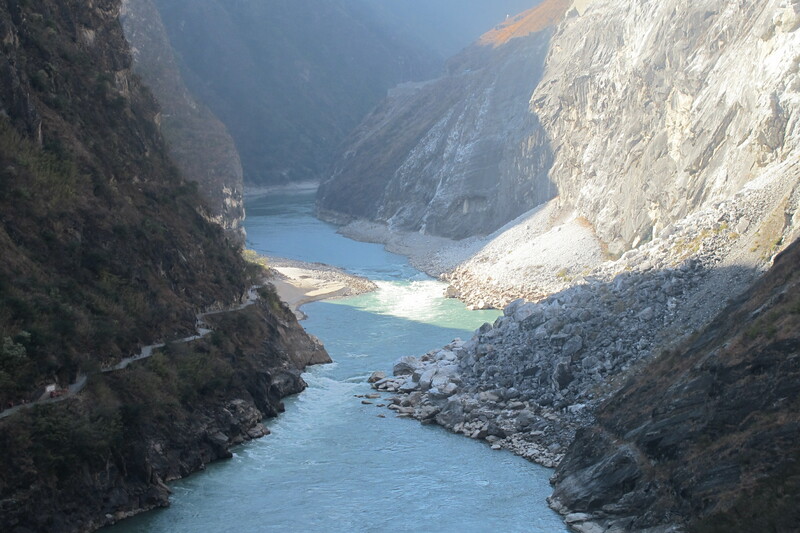 On the way I stopped at the first bend of the Yangtze River which was spectacular. 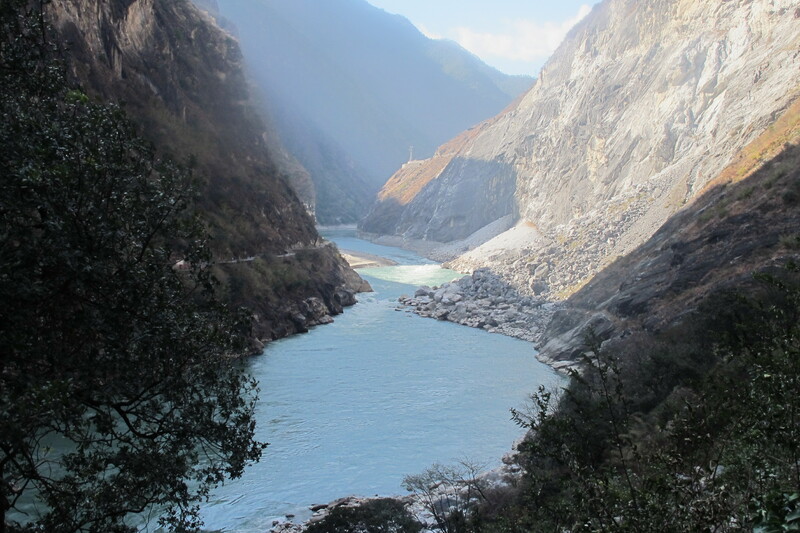 Next stop was Tiger Leaping Gorge – again spectacular but with 500 rather steep steps to climb down to the gorge and of course the same 500 on the way back [up]. In Shangri-la I stayed at the Songtsam Retreat (www.songtsam.com). 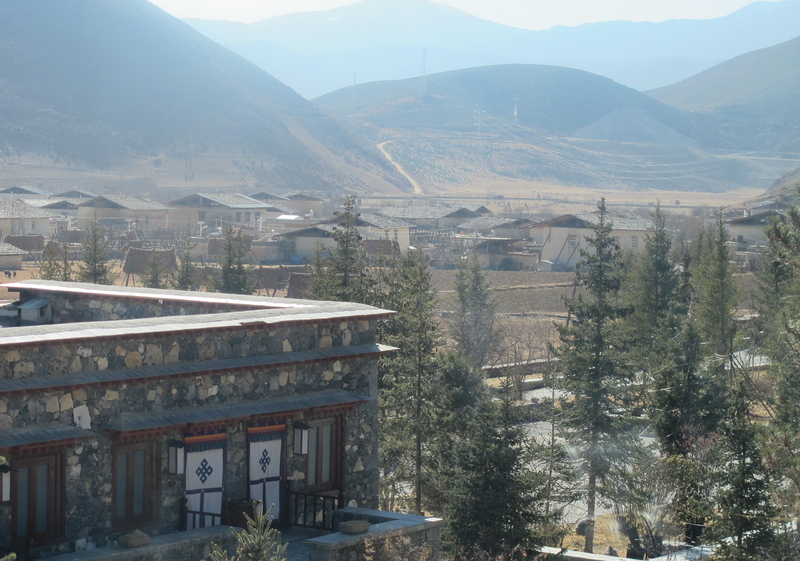 I had wonderful views of the Songzanlin Monastery and the grasslands. The hotel was fabulous; staff incredibly friendly and a really memorable evening. The high altitude was something I wasn’t used to but the GM of the hotel gave me some medicine and that seemed to work. 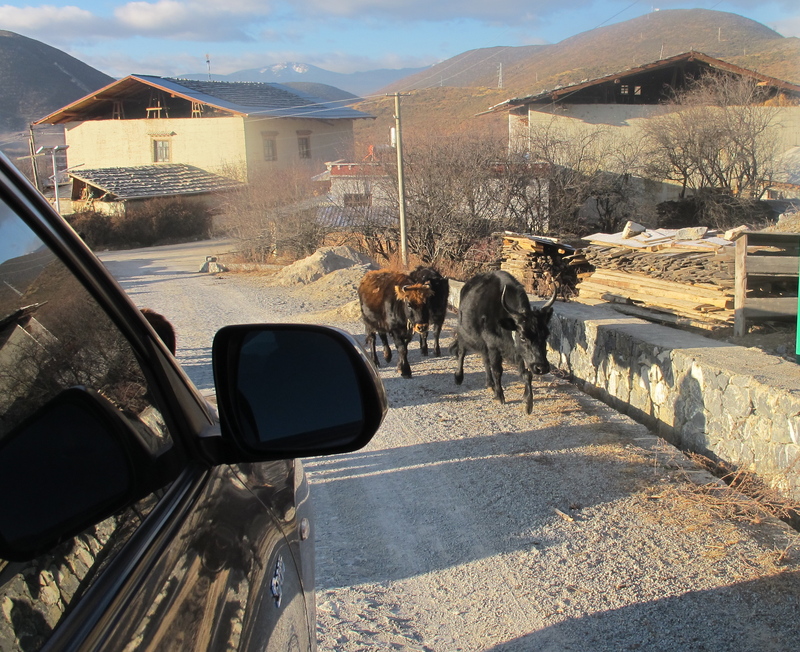 What I particularly loved about the villages in Shangri-la was the yaks/pigs and goats just roaming along the roads; on the highways; or just crossing the road to either get to better food or to get back to their homes. Everyone slowed down to ensure the animals were not injured which was lovely. 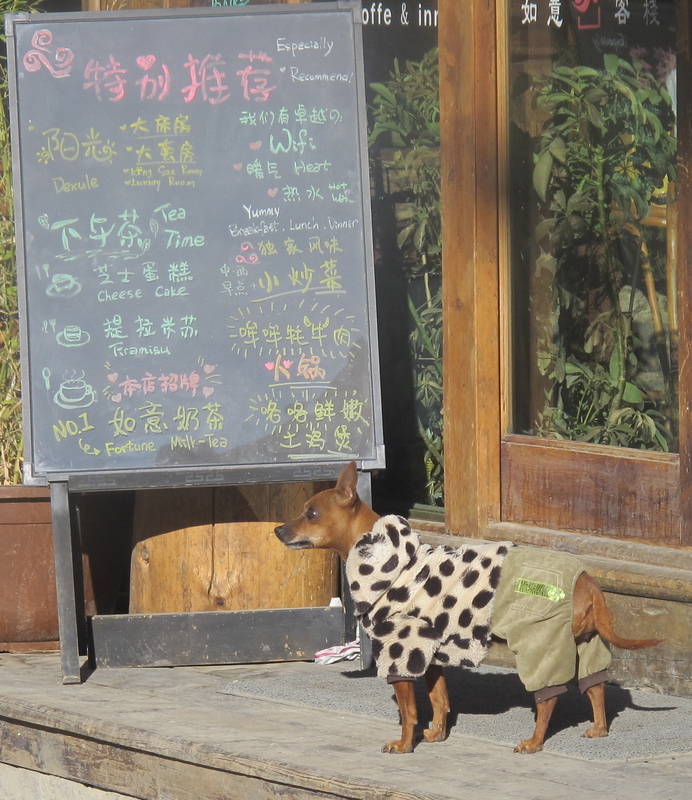 There was also one particularly cute dog in a very interesting outfit at Dali Old Town…[established during the Ming Dynasty and is said to be a gateway to the Silk Road in southwest China) but back to the dog…probably very warm but in a badly mismatched outfit including dog cargo pants! 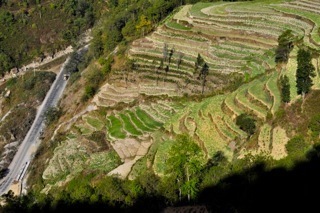 I loved Yunnan and one sight I particularly loved whilst being driven to both Dali and Shangri-la were the terraced mountains. 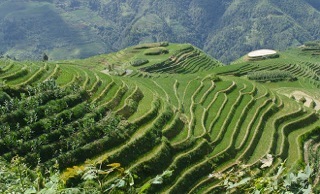 They were very green and lush in Dali and rather brown this time of year in Shangri-la – but still amazing to see. 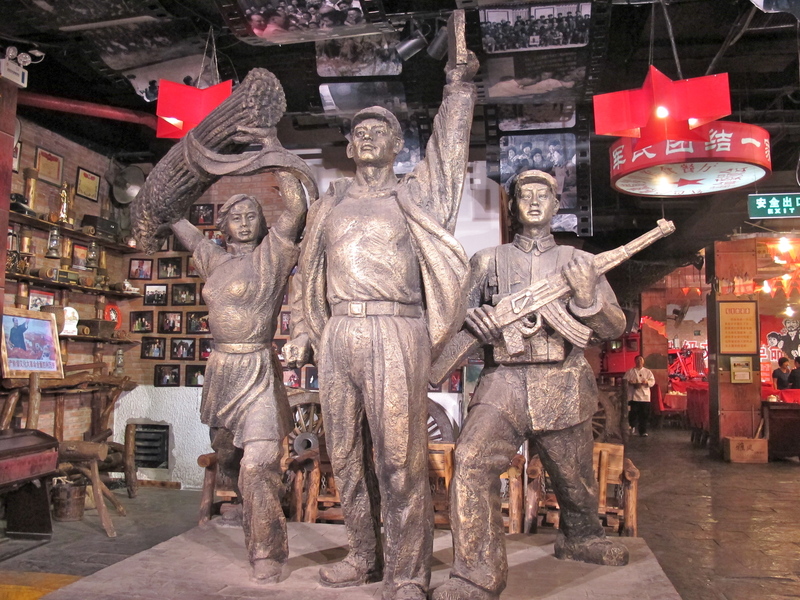 A little while ago I visited the Beijing Planning museum Exhibition Hall which opened in 2004 and is located beside Tian’anmen Square . 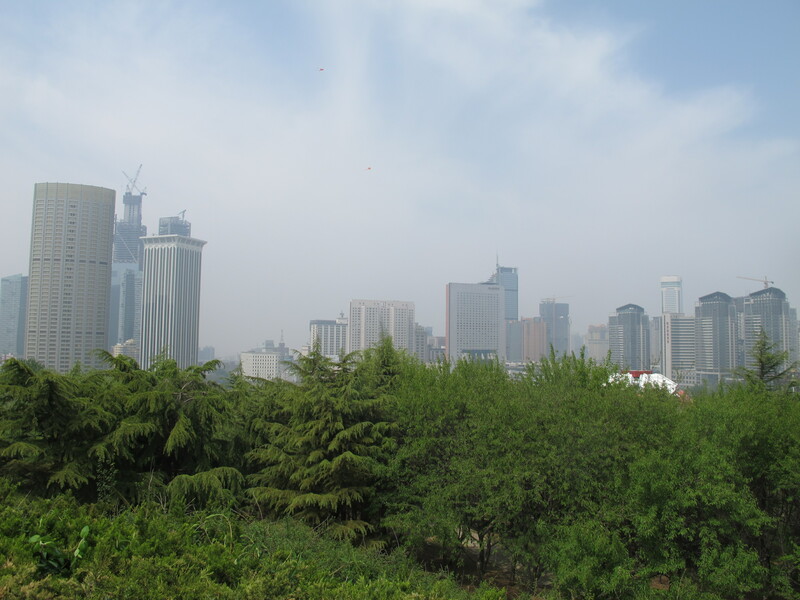 I think it is well worth the visit to learn about Beijing’s urban planning construction and the future of Beijing. I really enjoyed this museum. It comprises four floors with temporary and permanent displays. 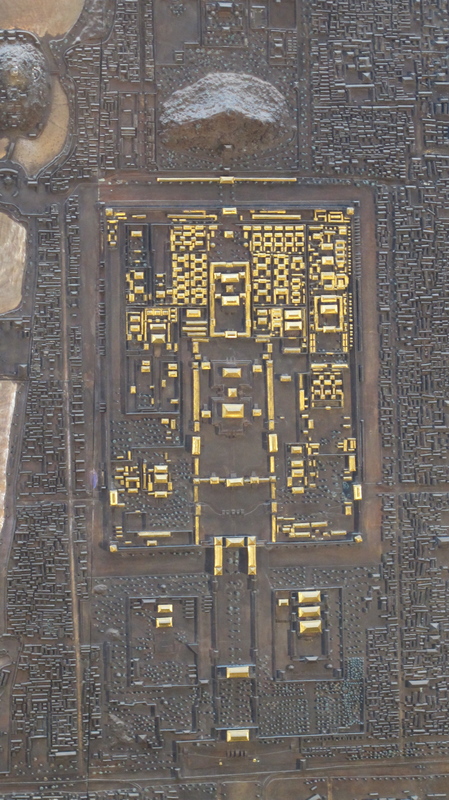 The whole exhibition area is basically divided into two sections, the development of the ancient city and the conservation of Beijing’s ancient relics. There are a large amount of photos, images, documents and artifacts which are used to show the overall development process. 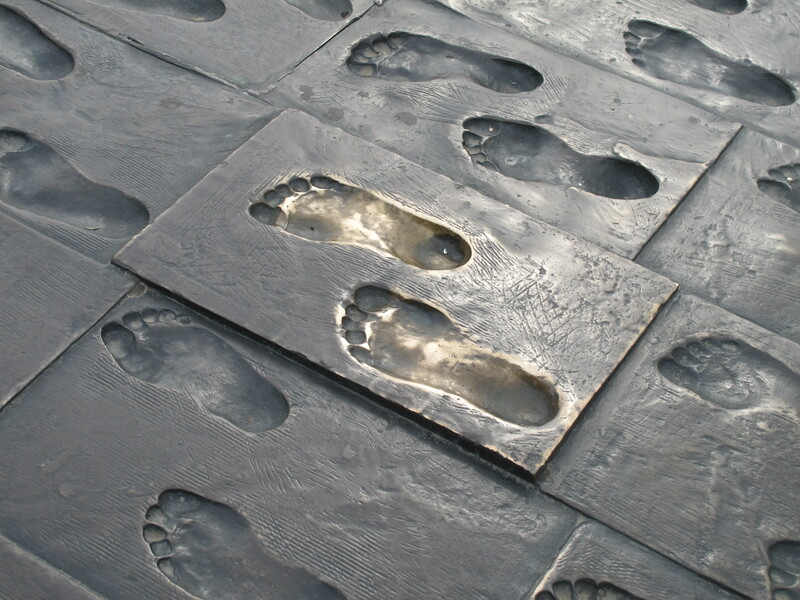 One very special display is a ten metre high and nine metre wide bronze wall sculpture located between the first and second floors. 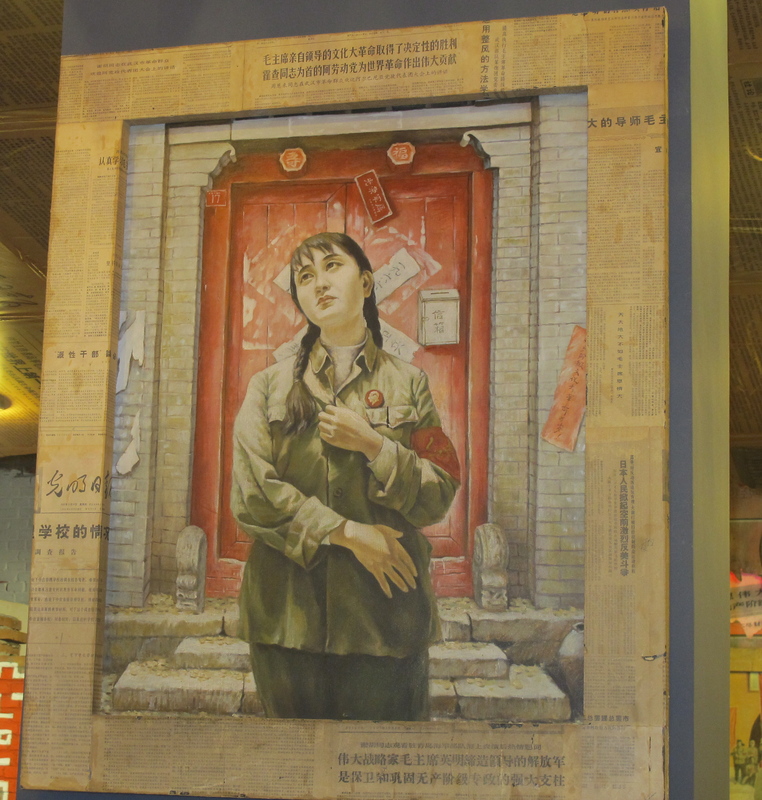 It is made with a scale of 1:1000 and fully illustrates the overall layout and characteristics of Beijing in 1949. 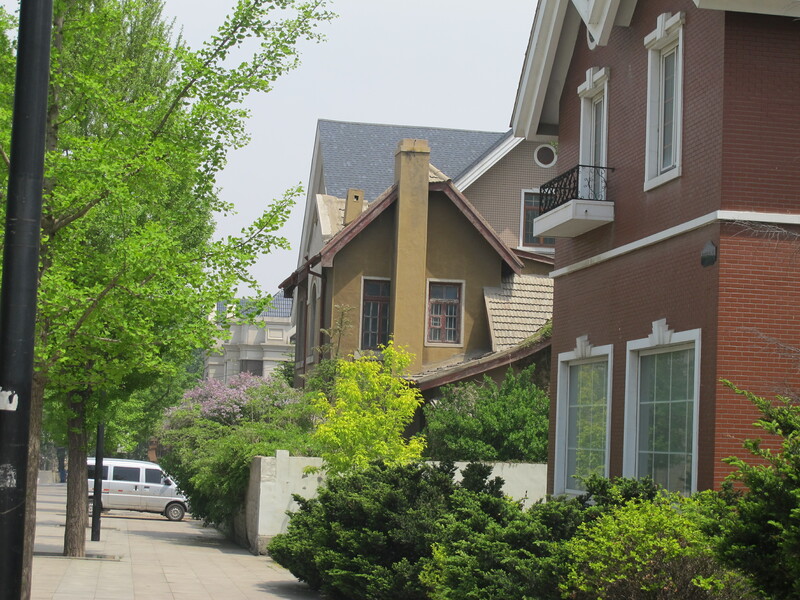 It features more than 118,000 houses, 60,000 trees and alleys, lakes and rivers. 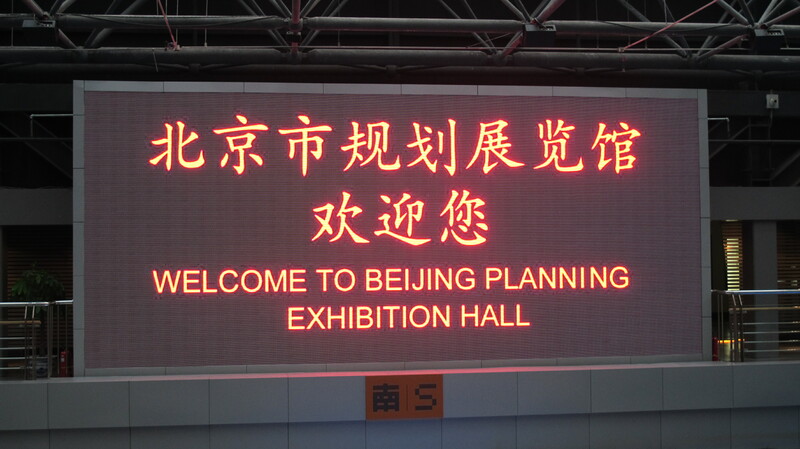 There is also a multi-media theatre which shows a video of the construction of Beijing and another about its future. 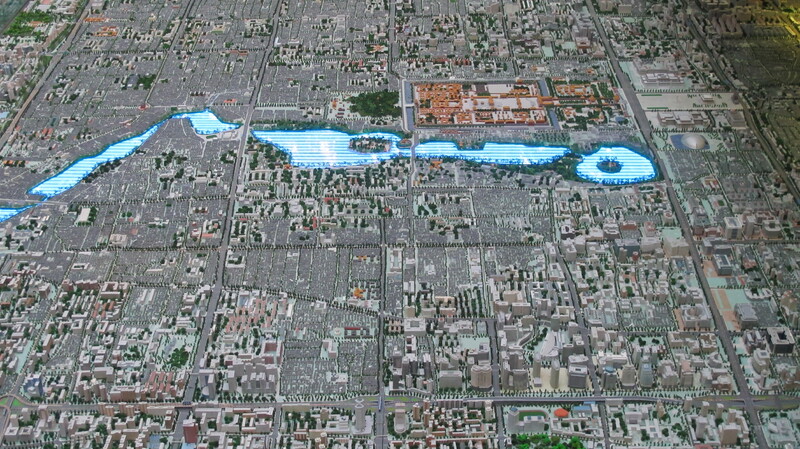 The focus of the museum, I think, is a large scale model of the entirety of urban Beijing, showing existing buildings which allows you to see Beijing and its surrounds. And there is also a glass floor which when you walk on allows you to see a map of Beijing underneath. All pretty cool!! 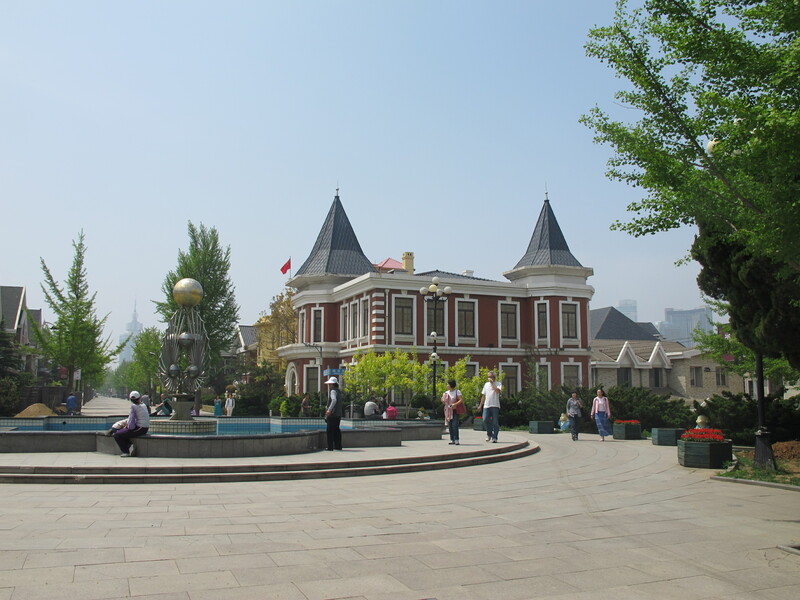 A friend of mine recently visited the museum and said he believes that it would be very beneficial for visitors to Beijing to come to this museum first before undertaking any sightseeing so they can understand the lay-out of Beijing and learn about and appreciate the city planning. 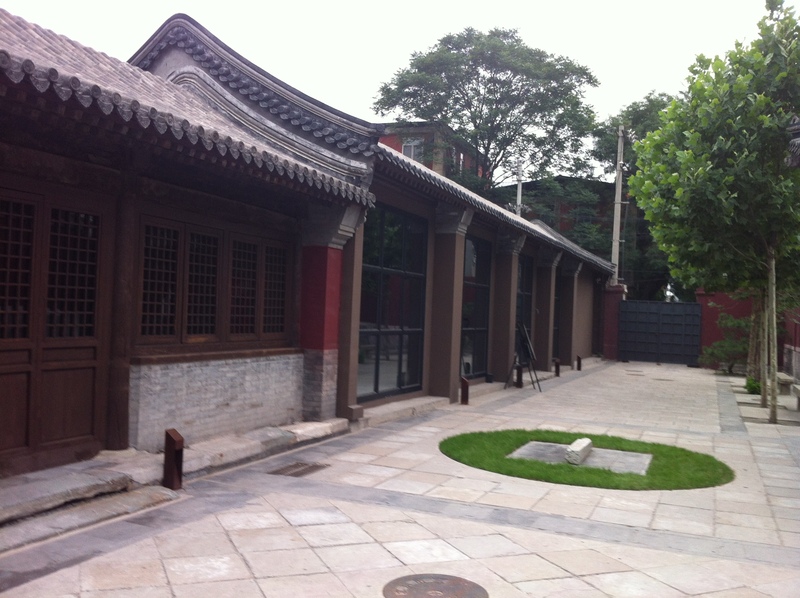 Address: 20 Qianmen East Street (east of the old Beijing Railway Station) 9-5pm and as with other Beijing museums it is closed on Mondays.